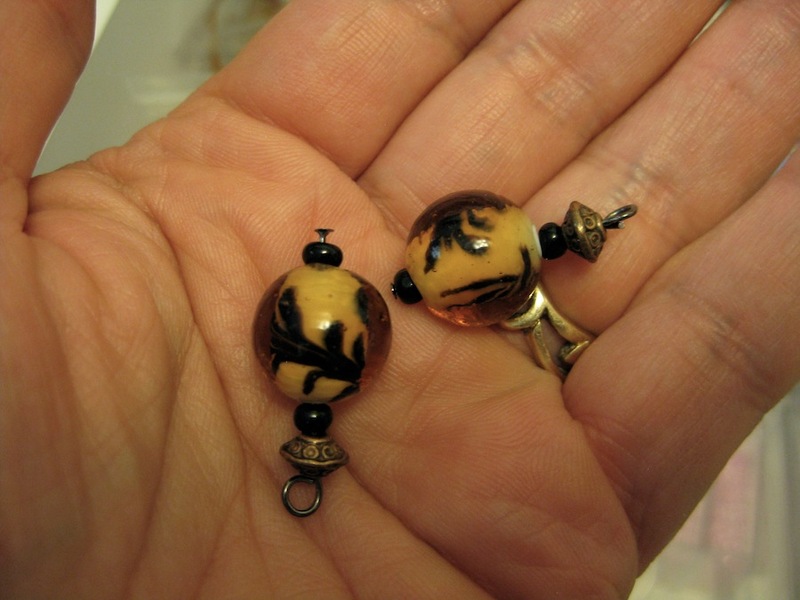 Over the past five days I have been diligently working in my craft room making these charms. It has been ca-ray-zee! 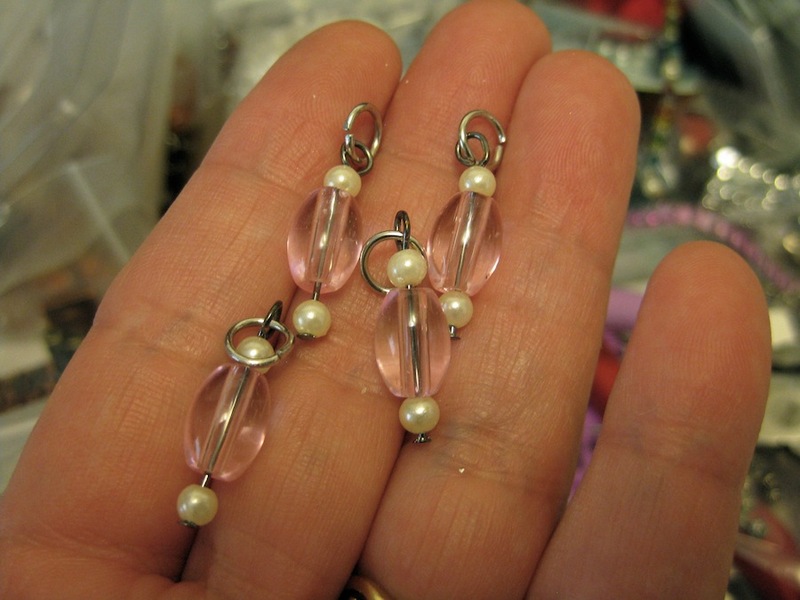 The small amount I had started making, last week, was not going to be near enough for the 10 purse charms I will be making as Christmas gifts for the girls and women in my family. So I made a trip to Wal-Mart and scored on packs of beads. 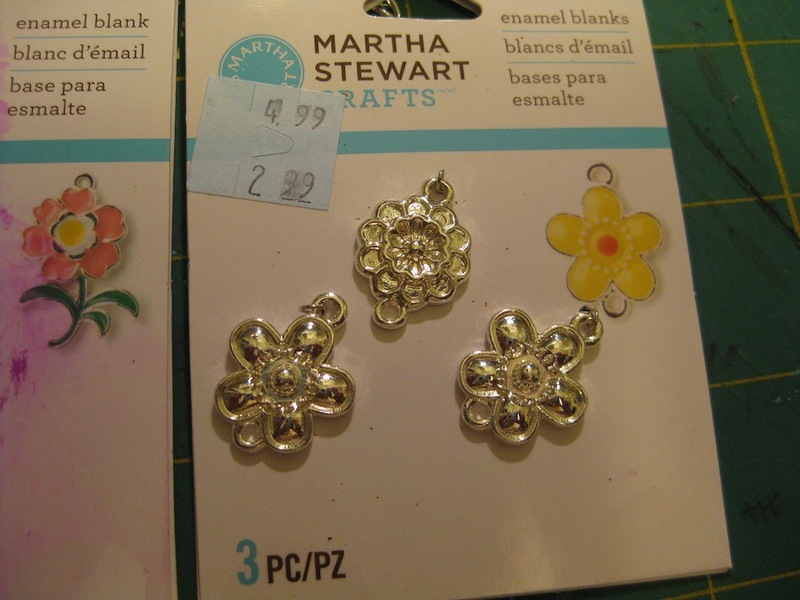 I then had to go back to Hobby Lobby – TWICE – for more head pins and jump rings. While Joe was home…he has gone back to the truck driving job for a while….when I mentioned I needed to go to the store he would ask “Hobby Lobby? !” Yes folks, I have been a bit obsessed of late. 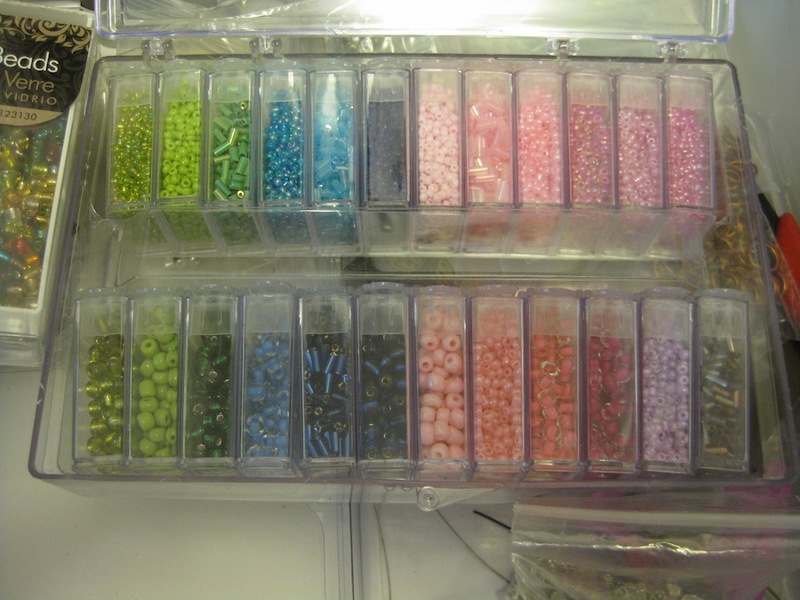 I have some Alpha Beads in my stash. These have been hanging around for several years. I figured it was time to put them to use. 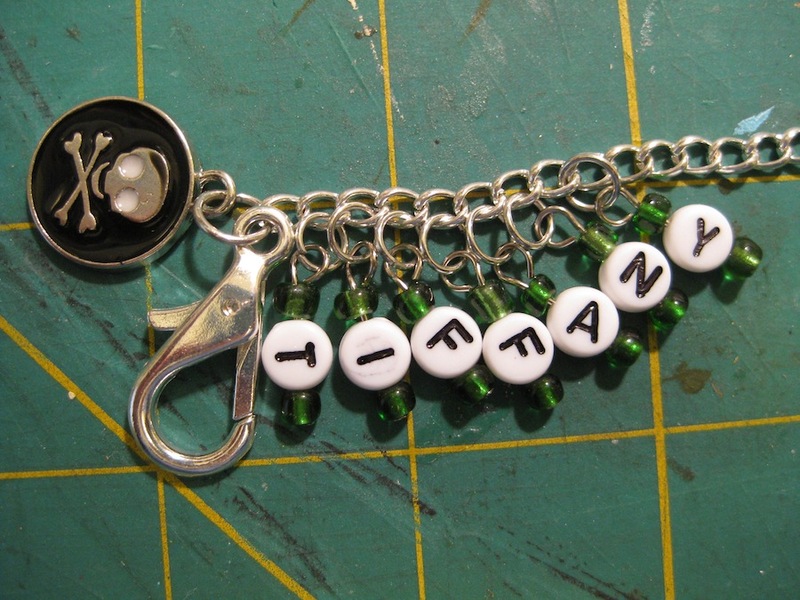 I’m putting names on each of the purse charms. Before you think I’m such a wonderful and thoughtful person….it is mostly so that I REMEMBER which one goes to whom :/. Also, so that I can quickly see who I have missed. I have found that if I keep the letters on the same side of the chain they lay better. 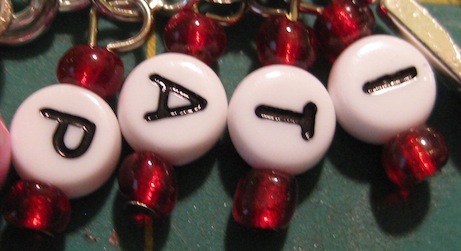 Tomorrow I will be getting the purse charms made. I think I will be posting the results daily instead of being gone for another week. 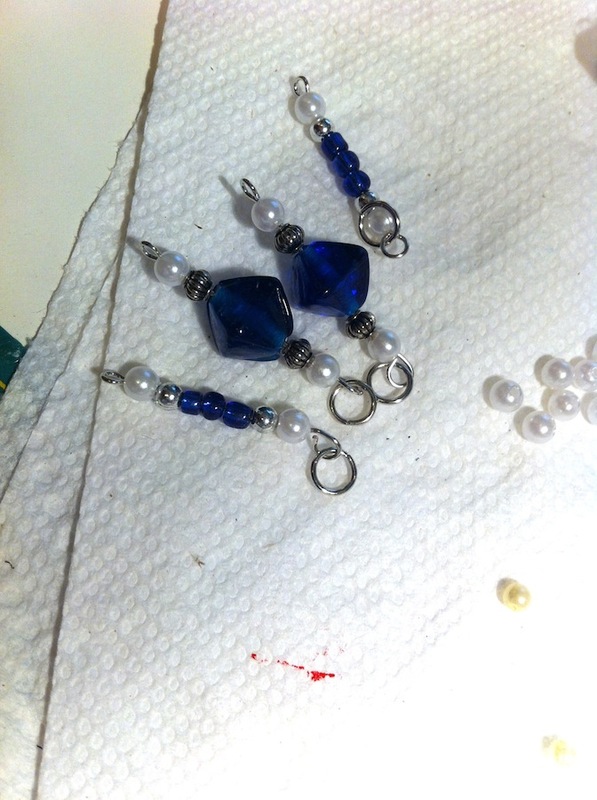 Results of my first foray into making purse charms. 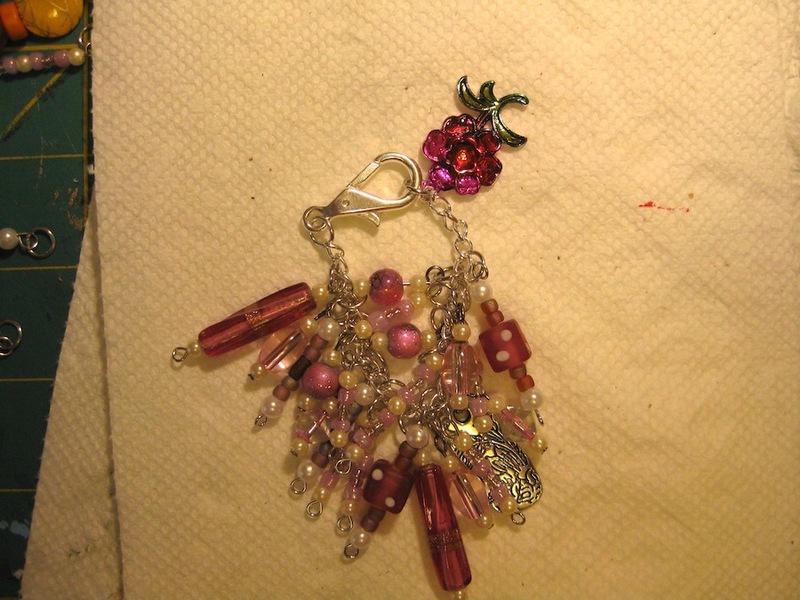 The products I have used to make this purse charm follows in this post. 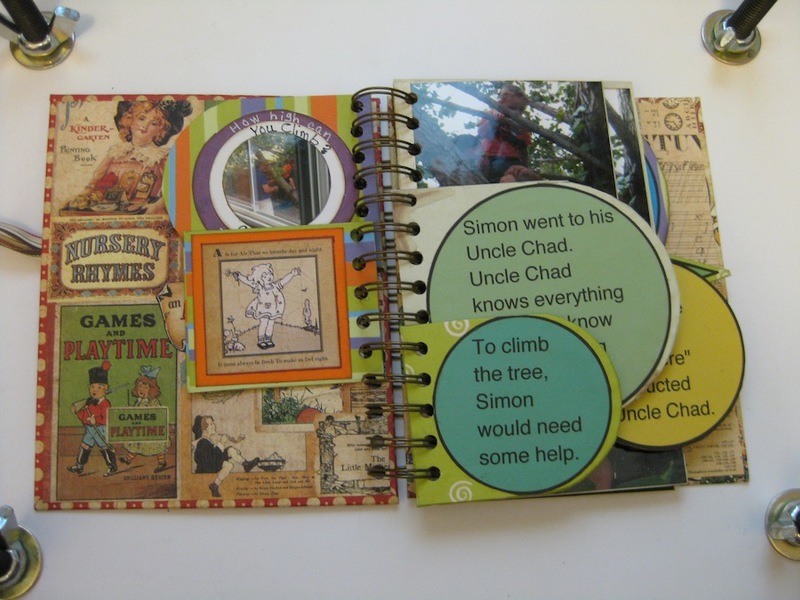 All of the things you will see in this post were purchased from Michaels. Some recently and some a long time ago. 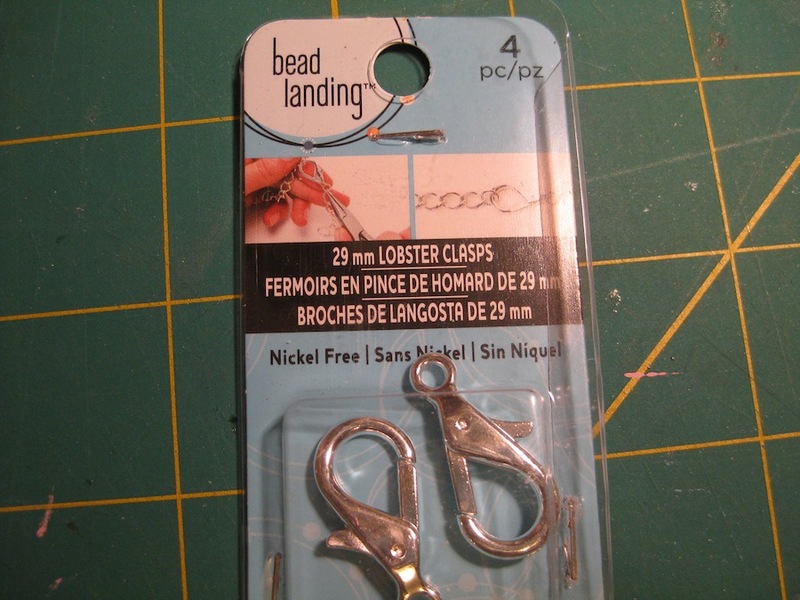 I found some large Lobster Clasps from Michaels. This purchase was made just a few days ago. This comes in a set of four. Silver Plated Chain. 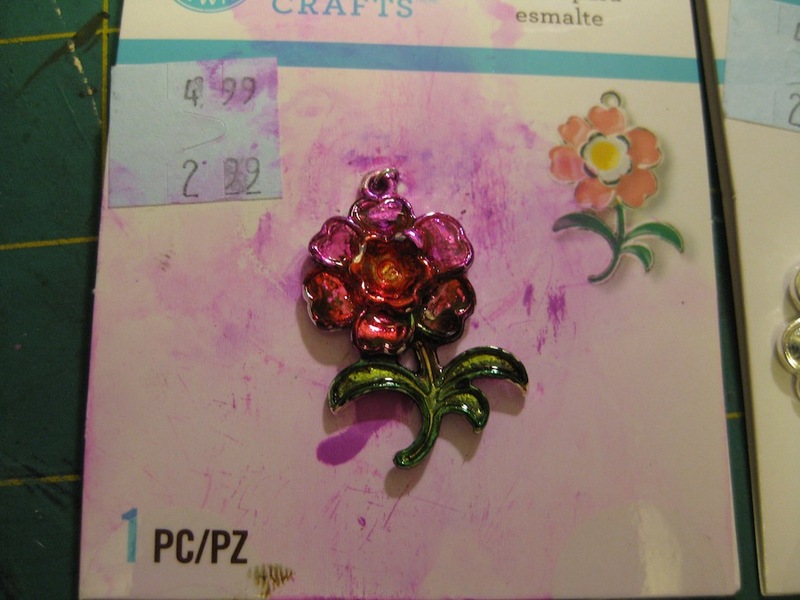 This item was purchased from Michaels several years ago….probably more than three years. It is one of the crazy “toss in the basket” choices that I had no clue what I was going to ever do with once I got it home. It was chucked in a drawer and buried under lots of other stuff. The only explanation I have for this next purchase from Michaels is the cost was $.90. LESS THAN A DOLLAR. Oh, and it was shiny I seem to be an ostrich. If it is shiny I have to grab it This purchase was well over a year ago. Michaels had built a new store in my area and they were doing everything they could to eliminate moving older stock to their new store. Everything was on crazy discounts. One of the charms I messed with. Alcohol ink works really great on this cheap metal. Once I had the color scheme made (only because my alcohol ink choices are limited) I used Glossy Accents over the dried ink in an attempt to save my work. Don’t know how long this is going to last. 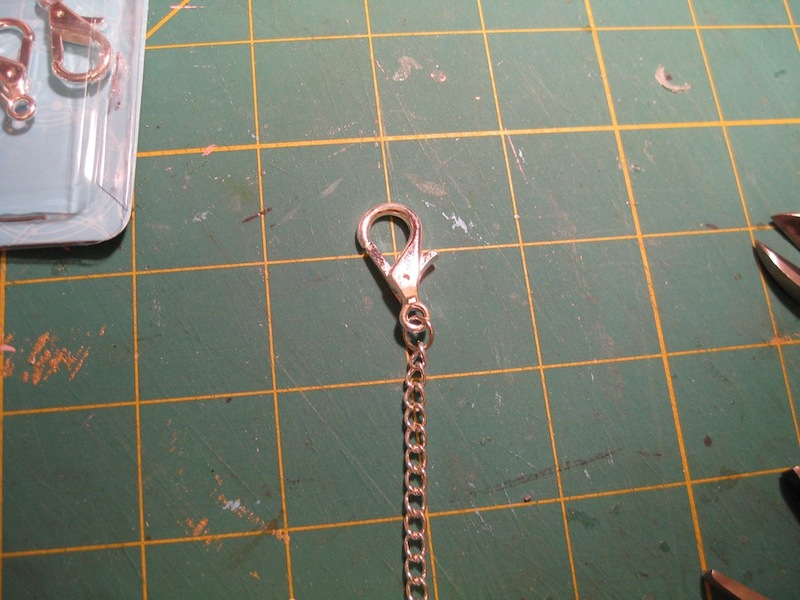 I attached the Lobster Clasp to the end of a length of the silver chain with a jump ring. 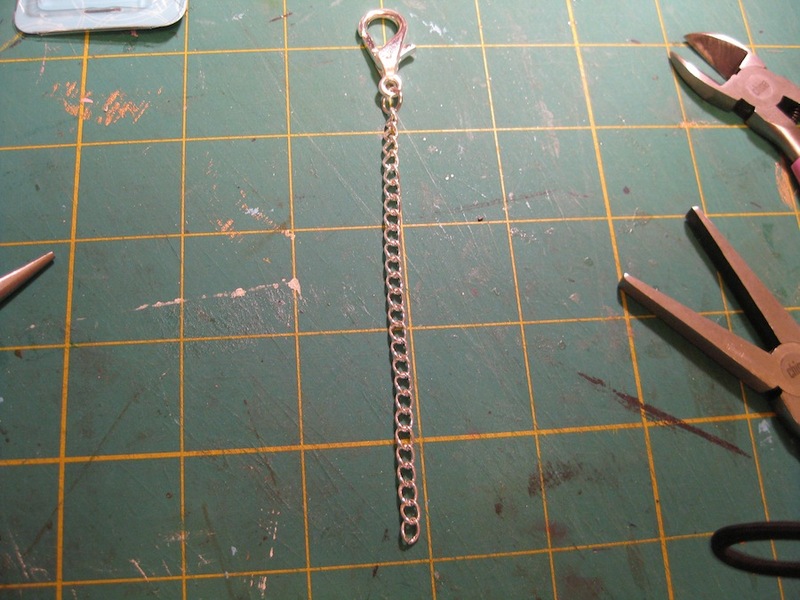 With my wire cutters I cut the chain to a 4″ length. Why 4 inches? 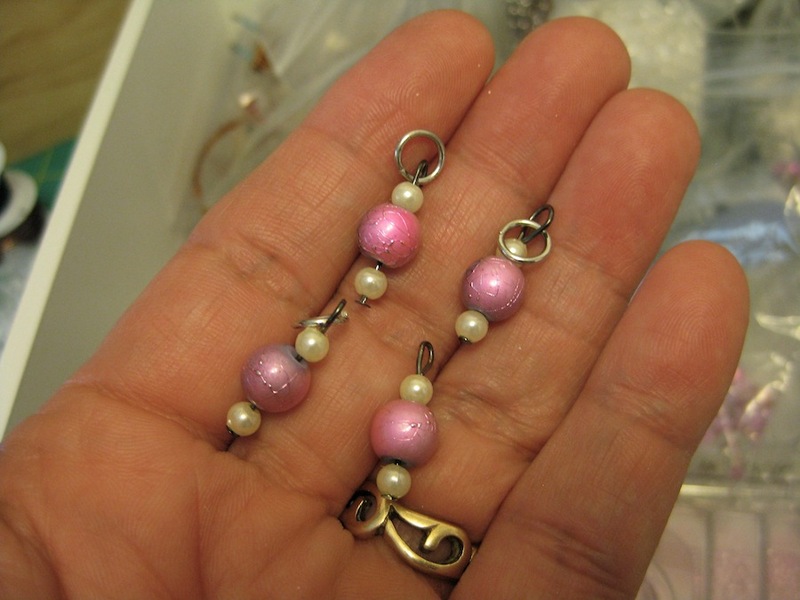 Only because many of the videos I watched on making purse charms called for that length. So….other people are the experts and who am I to question them? 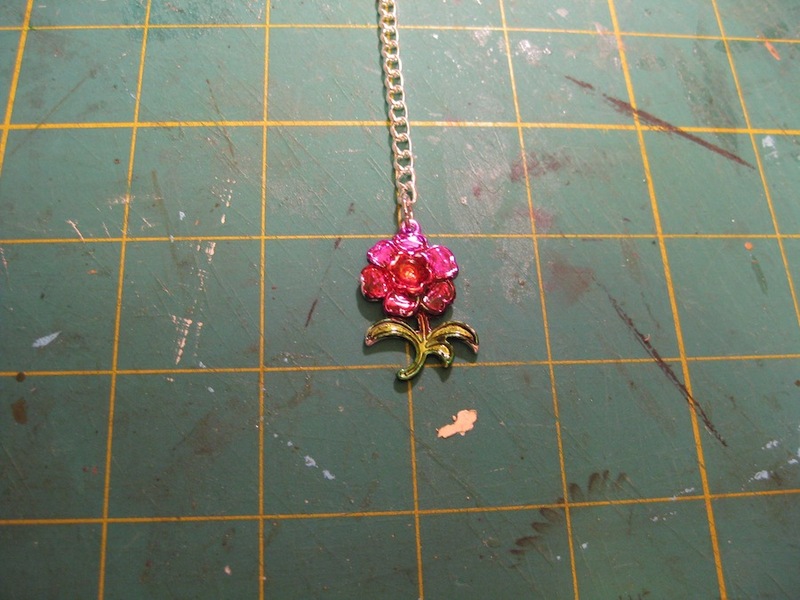 I attached the flower charm to the bottom link of the chain. So far so good. Now come the hard part. 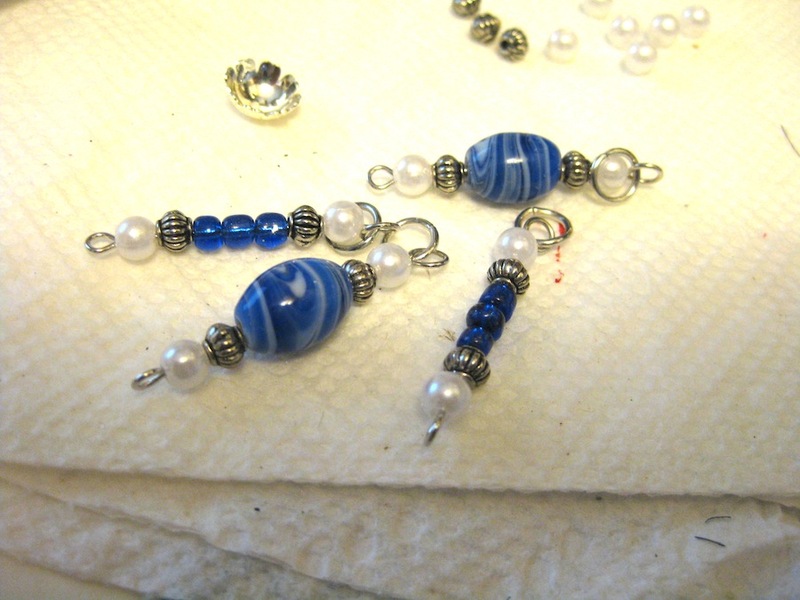 Attaching the individual bead charms to the links of the chain. My left index finger is quite sore from working with the jump rings. 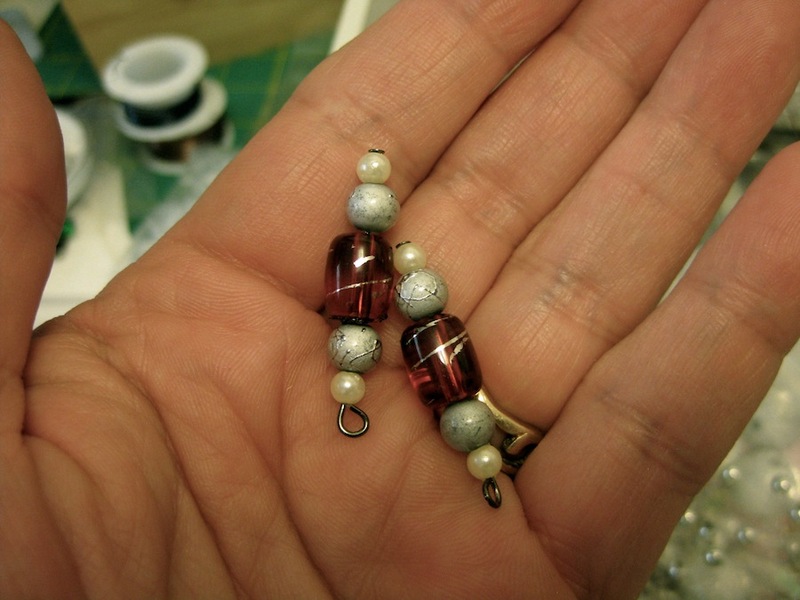 A CAUTIONARY NOTE: Find the CENTER of your chain to add a large charm that is not beads. I just stuck the silver charm on the chain and that is part of the reason the whole thing looks unbalanced. 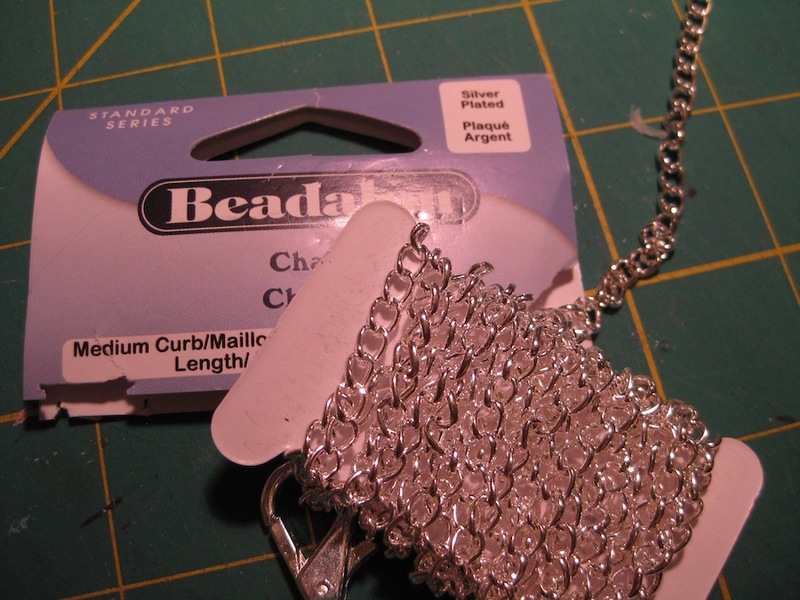 You will need to put the bead charms on each side of the chain. This is quite tricky since I had to pick the whole thing up to add the charm then fiddle with it in closing the jump ring. 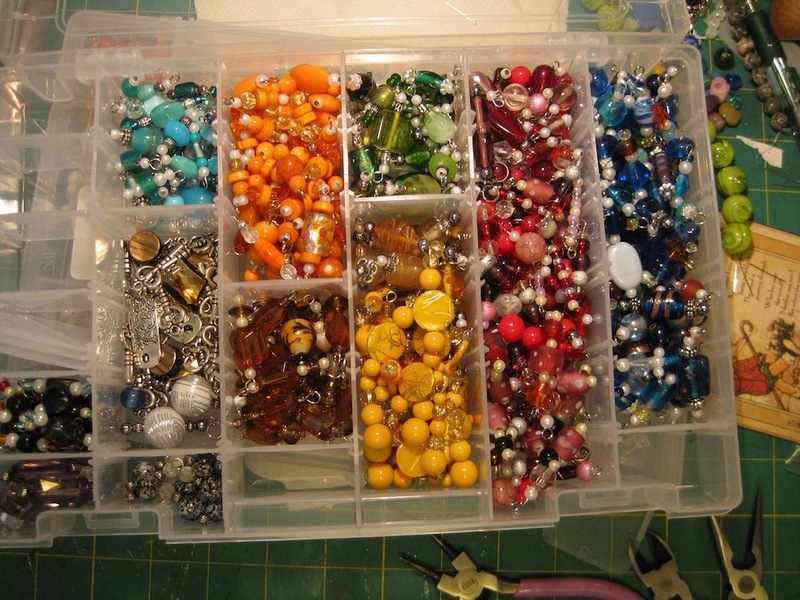 Getting all the beaded charms to lay out flat was like chasing a bunch of kindergarten children on a play ground. All I have to say for myself is that it does attach to a purse. Not the most spectacular and awe inspiring piece I have ever seen. 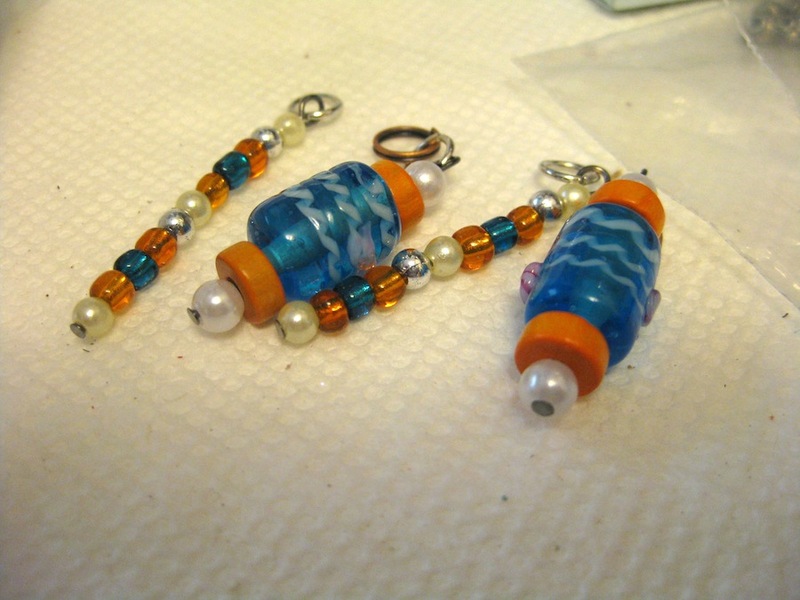 I think I needed more of the larger glass beads and less of the small bead strings to make this thing pop. 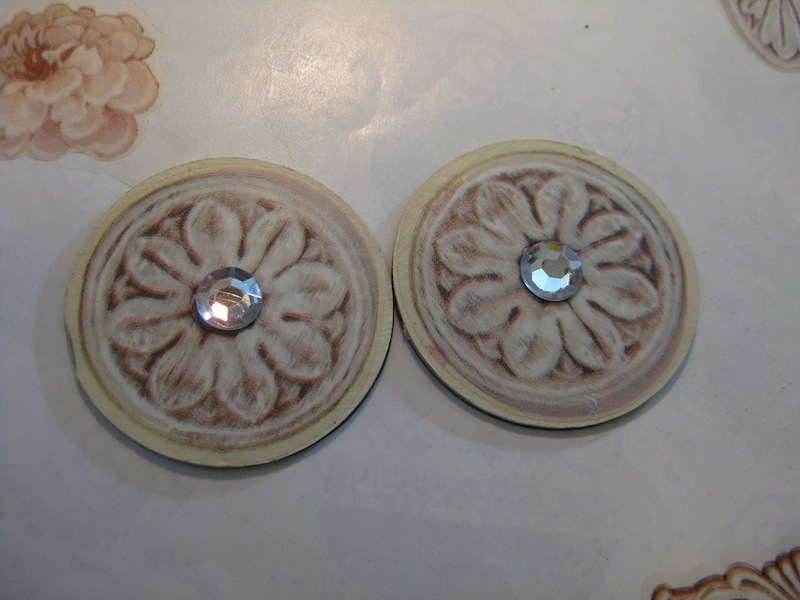 I do know that the next one I will find the center to place the non beaded charm to hang better. If you have never made “jewelry” before I can tell you one of your fingers will be sore and tender from working the jump rings. Your eyes will give you fits in focusing. Trying to see that teeny tiny space to close on the jump rings will make you think you are damaging your eyes forever. After you have hung the sixth charm on that crazy chain you will wonder at your sanity for even starting this project in the first place. 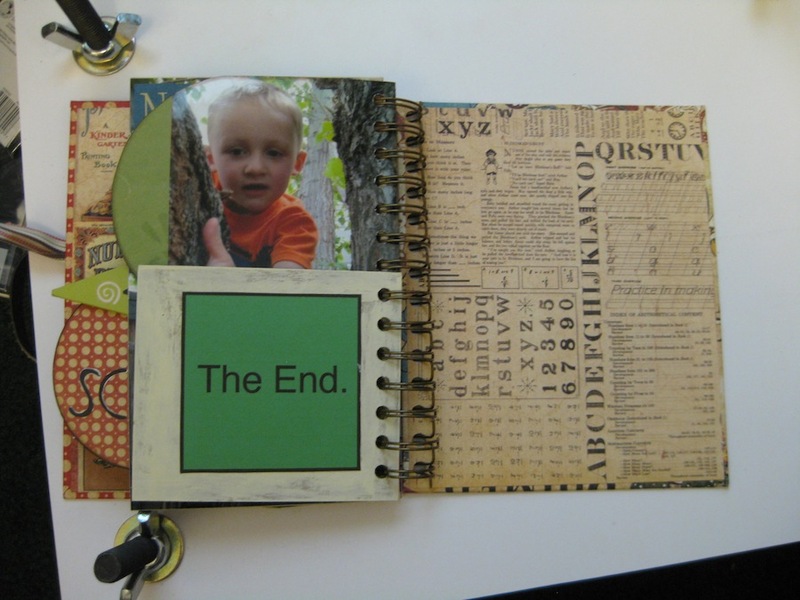 Keep plugging along until you have finished one project. I hope that I have inspired you to give this a shot. 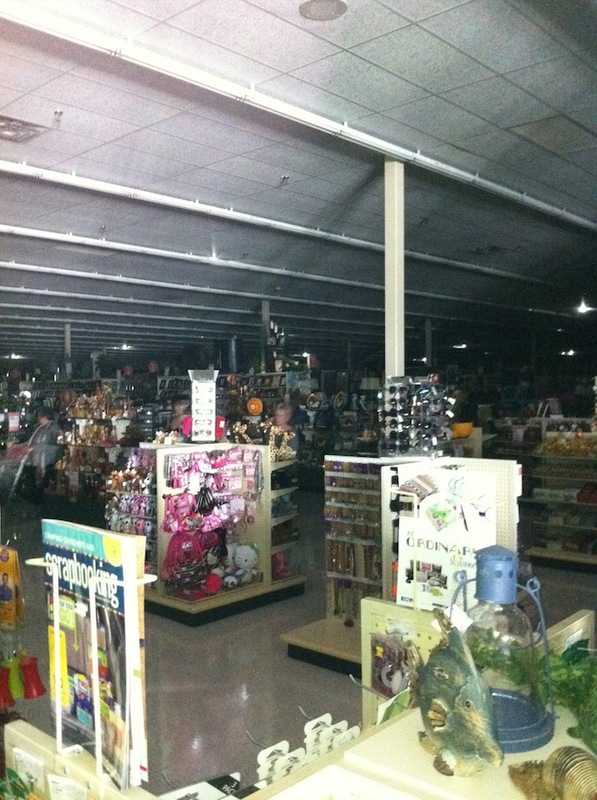 Power outage at Hobby Lobby. It has been quite a while since I set foot in a craft store. Mostly because I am determined to use the stuff I already have and not purchase more. Joe and I went to Hobby Lobby, near our home, last night. I was getting low on jewelry head pins and jump rings. I found the needed items and we went to the check out area. While we were waiting in line for our turn the lights went out. No one knew when the power was going to come back on so we left and headed for Michaels. A new store was built closer to where we live. It is a bit disappointing. There is only about half the products in the new store as what was in their older store. I was not able to purchase the head pins. All that was available were eye pins. I bought some anyway. 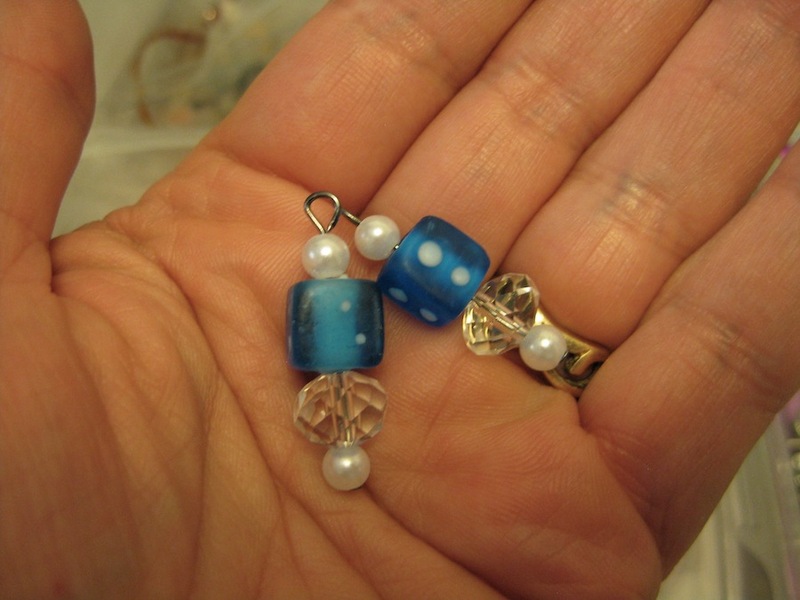 I have been making some coordinating charms to go with the fancy glass bead charms. This set turned out really beautiful, if I do say so myself. I really like the orange and blue. 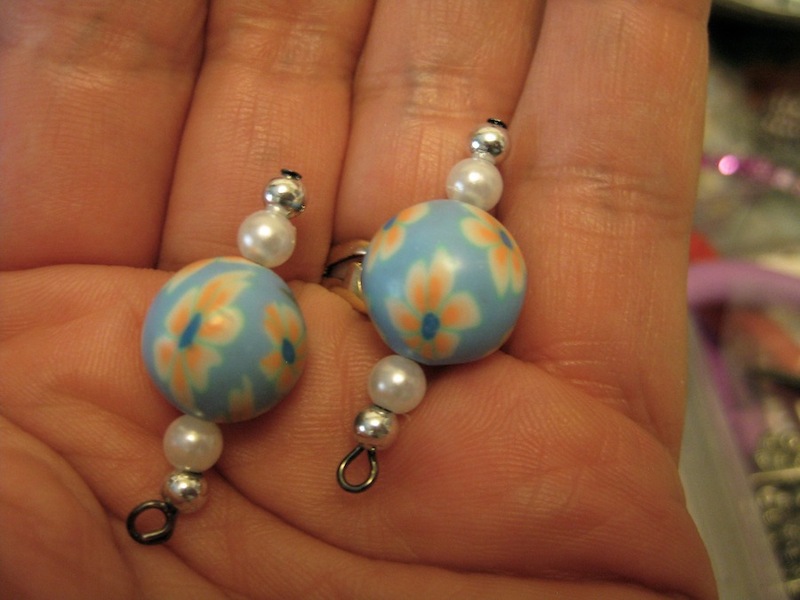 These swirls on the blue glass beads are beautiful. 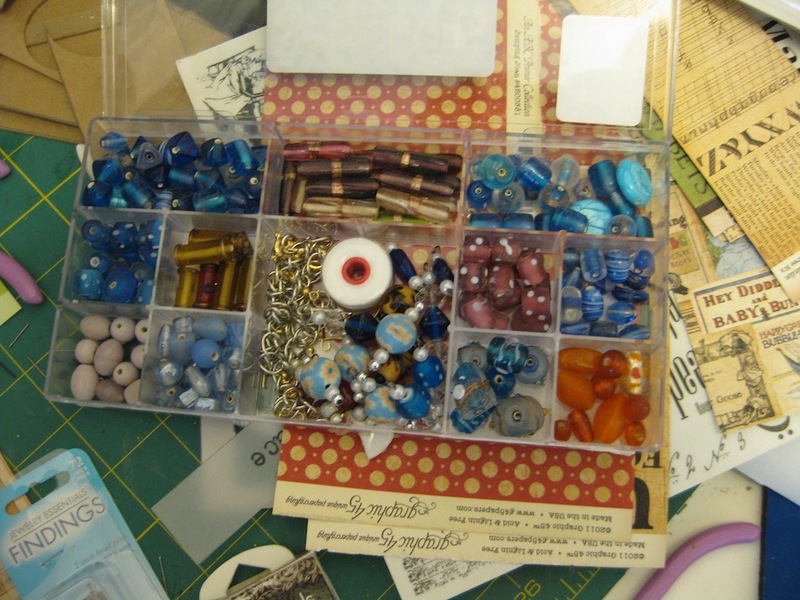 I have some bead sets that I had purchased a long time ago and have kicked myself black and blue for buying them. Now I am really glad that I did. I have an assortment of charms in an old pickle jar. It is getting more full by the day. 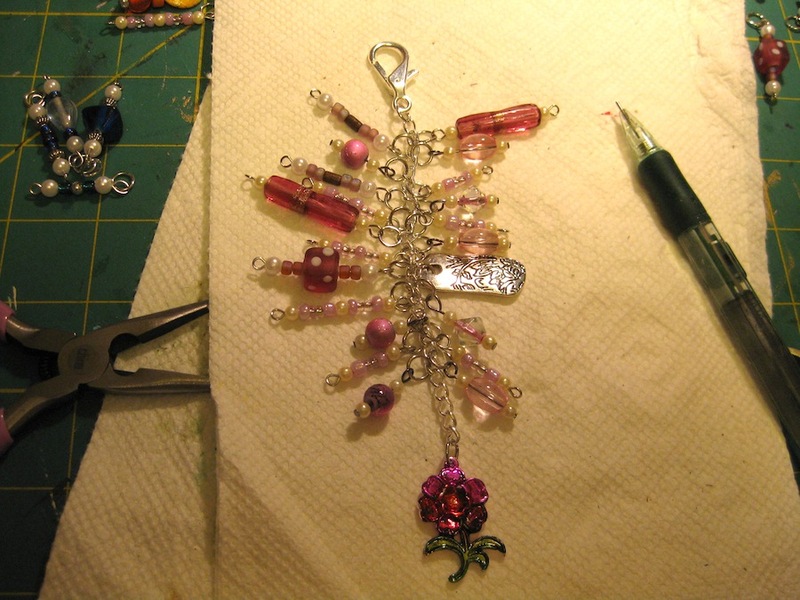 I think I will have a Purse Charm that I can show you in a couple days. 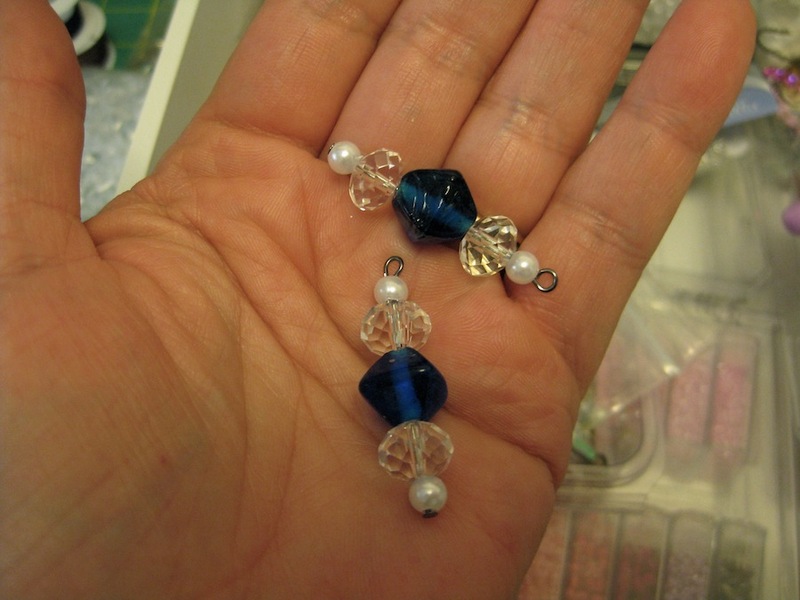 I hope that I may have inspired you to take a stab at some beading. Inspiration found during absolute boredom. I have days that I can’t do anything. ANYTHING! Let me explain it this way…..
For those of us that are over the age of….say 45. We feel like we are still in our 20’s. We don’t feel the changes of “Middle Age”. We have a few grey hairs and a few more wrinkles. Our spirits though, inside of us, think we are still 20. I can tell you that I have felt this way for a long long time and I have just reached the age of 60. Okay. So we feel young and still full of piss and vinegar. We can still do everything we used to do. That is until we get with one or more of the actual “20 somethings” and walk with them. They are faster than us and we have to double step it to keep up with them. Okay, okay. So I have to double step it to keep up with my kids. This illness confounds me. I wake up in the morning and feel fantastic. I feel like I did before I got sick. I feel like I can get back to work. One load of laundry in the washing machine, a few minutes sweeping the kitchen floor, and several more minutes emptying the dishwasher and I’m done for. The remainder of the day is spent in a stupor, like I am in desperate need of a nap. Push it a little further and I get a headache that won’t go away. Let me tell you this. I get extremely BORED! I can get a couple hours of my paperwork done a day before the tiredness sets in. 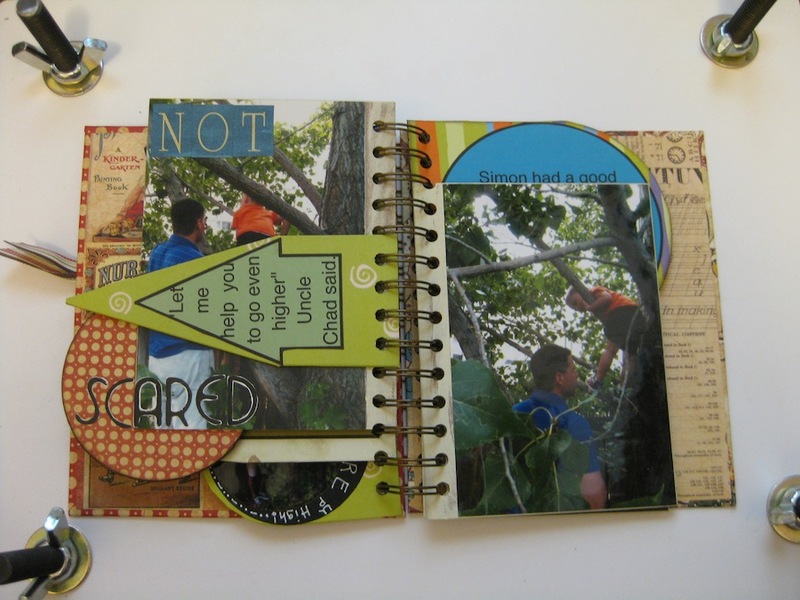 I went through a period of time that I had totally lost interest in all things crafty. 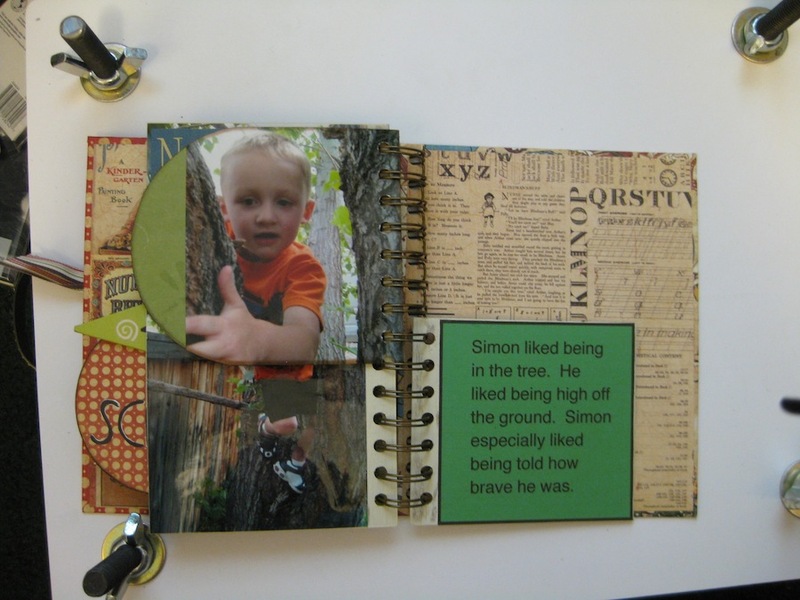 That is part of the reason why it took me nearly a month to make the book I made for my grandson Simon. During one of my video watching spells I came across BSUEBOUTIQUES on YouTube. This woman has a great sense of humor. She has someone running the camera during her video tutorials and she mentions his name from time to time as she instructs him where to focus the camera. Her vast knowledge of antique jewelry is way over my head but she would be a good source for anyone that wants to learn about vintage jewelry. I watched her video on making a necklace she calls “THE KITCHEN SINK”. And I found KELLIE MURTON featuring her “PURSE CHARM FOR MY FRIEND CARRIE”. I don’t know if you remember this or not. 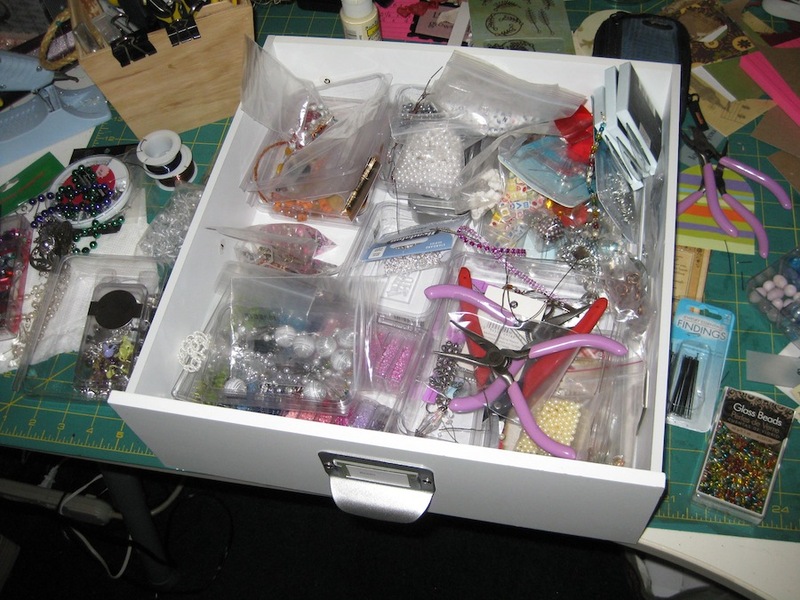 I have a drawer in my craft room that is full of beads and stuff. 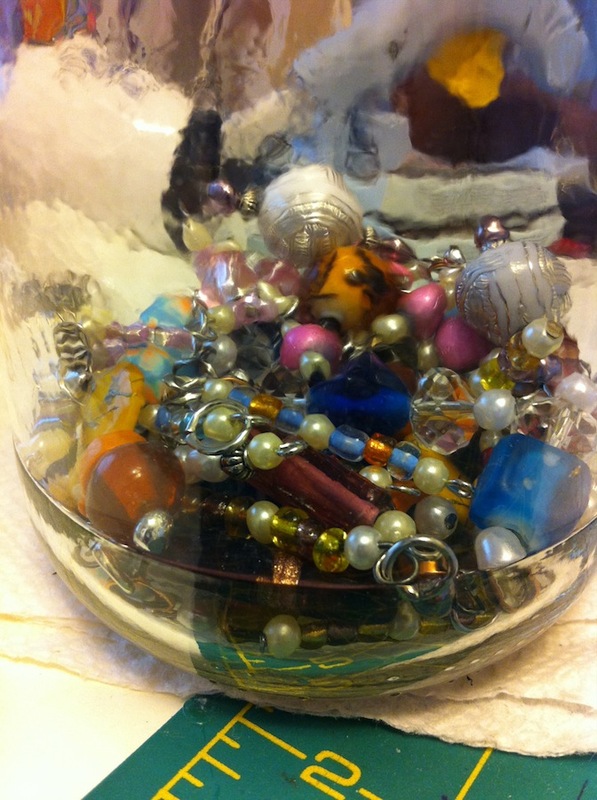 I have some glass beads I purchased from Tuesday Mornings….circa 2010. I can do things for long periods of time that only require minimal exertion. 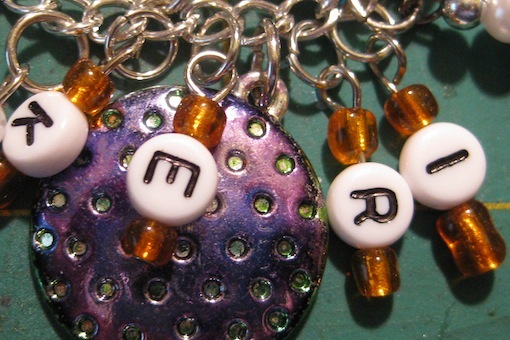 Don’t look too closely at my looping skills on these charms I’ve made. The first ones I made are a bit “gappy” in their spacing. Learning a new skill has its own process. Oh, and don’t remind me of my messy table. I will be cleaning that off in the coming days. Okay, here you go. This is what I have made so far. 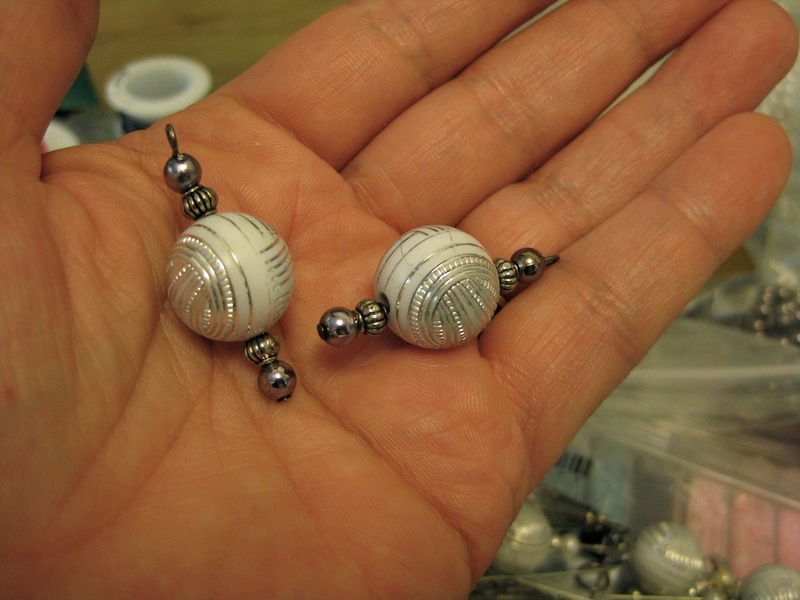 I have NO IDEA what the sizes of the beads are. 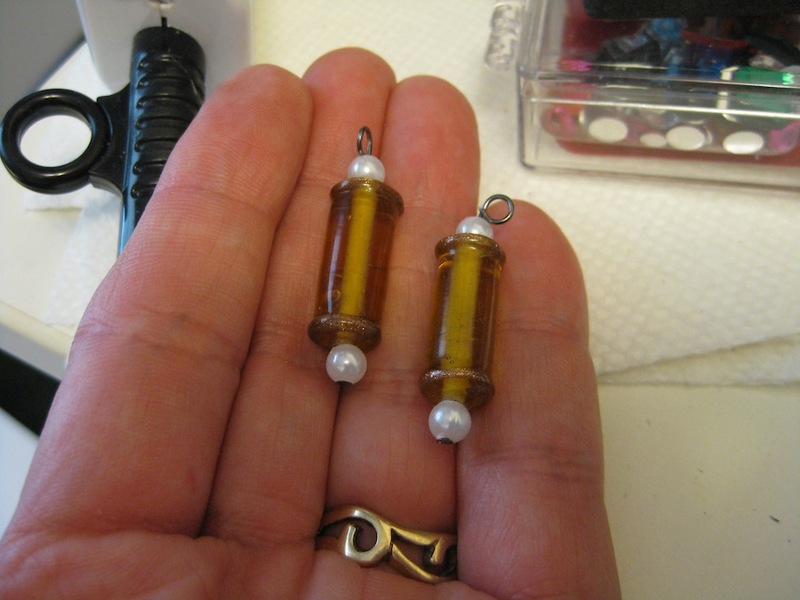 All I can tell you is that I’ve used 2 inch head pins to connect all the beads on a charm. None of the beads I own have any kind of label on them that states the size or even what it is called. 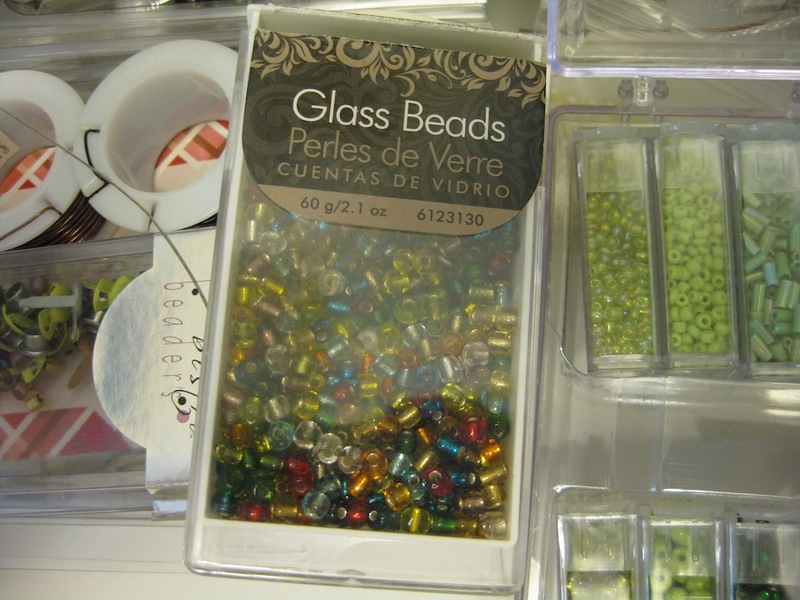 Some of the beads have come from necklaces I purchased at a truck stop because I liked the colors. I won’t be making any necklaces. 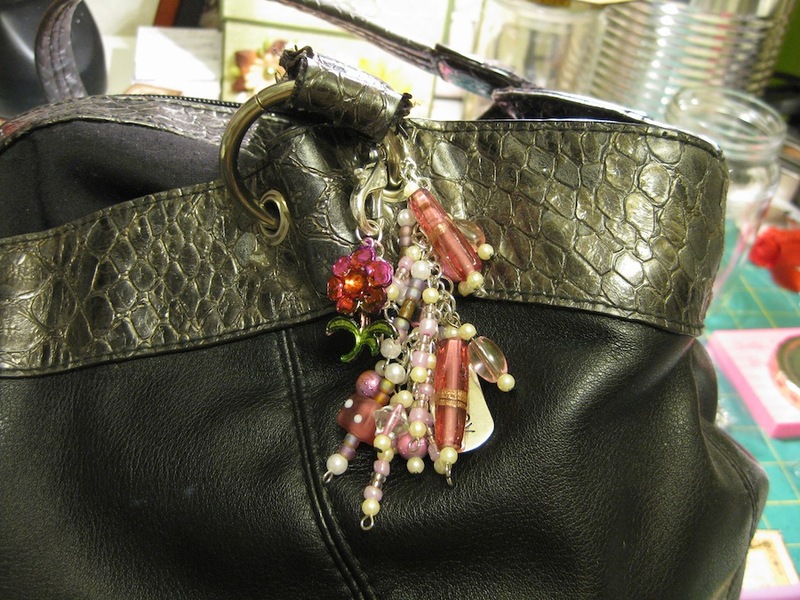 I am going to try to make some of the purse dangle things for my daughters and granddaughters for their Christmas gifts. 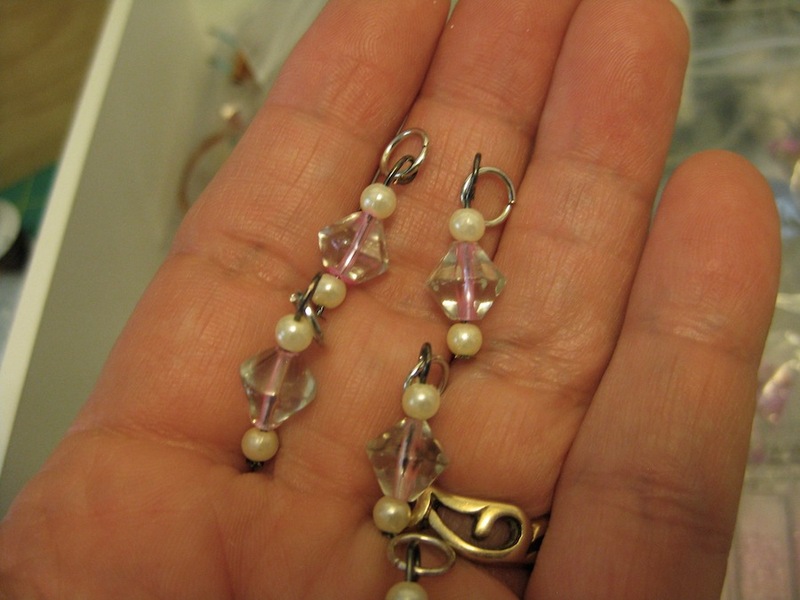 If you are interested in making jewelry there are tons, and I mean TONS, of videos on YouTube featuring all forms of jewelry making. Look. 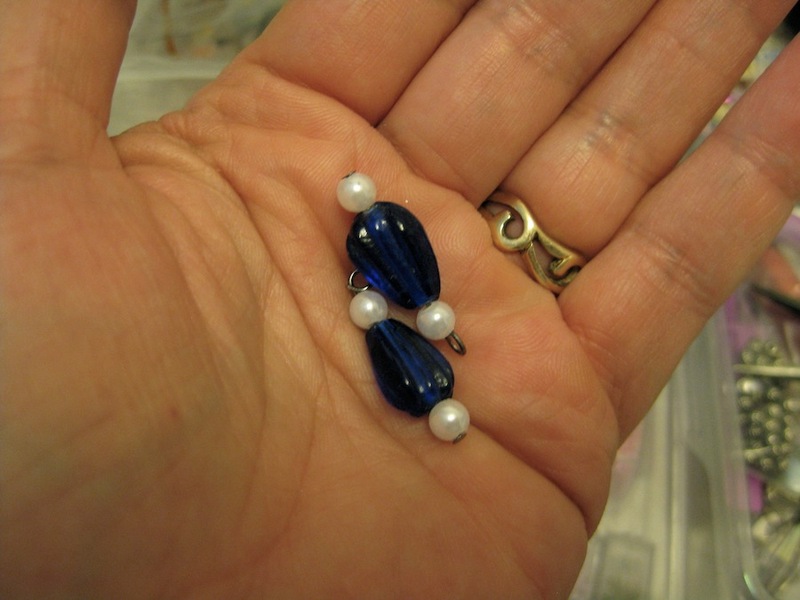 If I can put some beads together on a pin and make a loop then YOU CAN also. 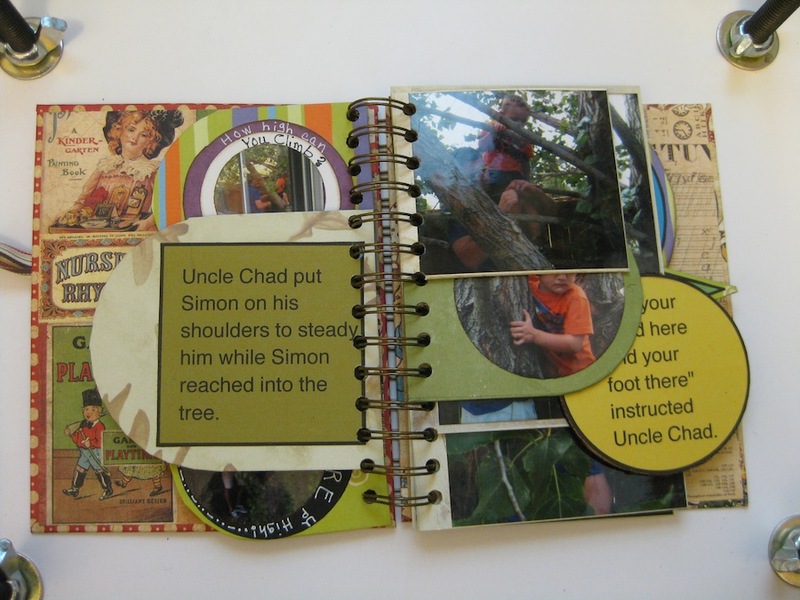 Hope this has inspired you to start thinking about your Christmas gifts to friends and family. Epic FAIL! Glitter is my nemisis. 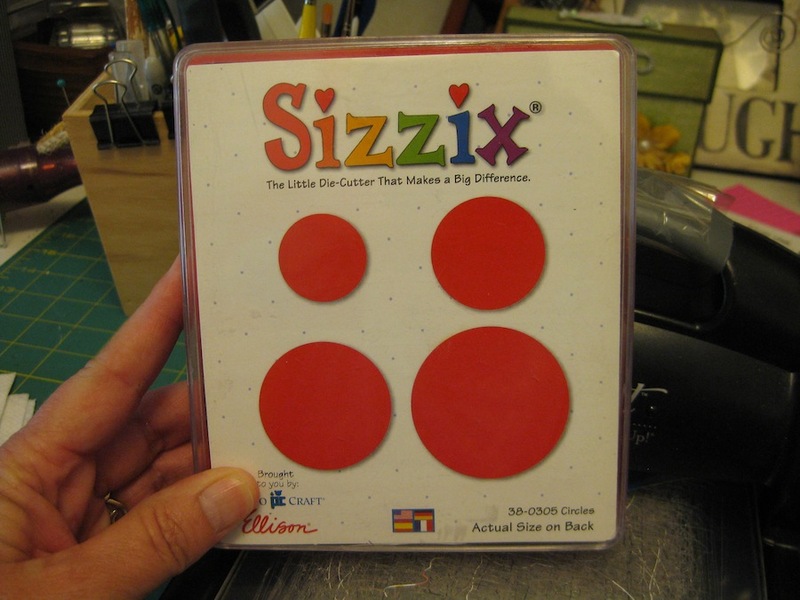 I don’t remember if I’ve shown you the circles Sizzix die I have. 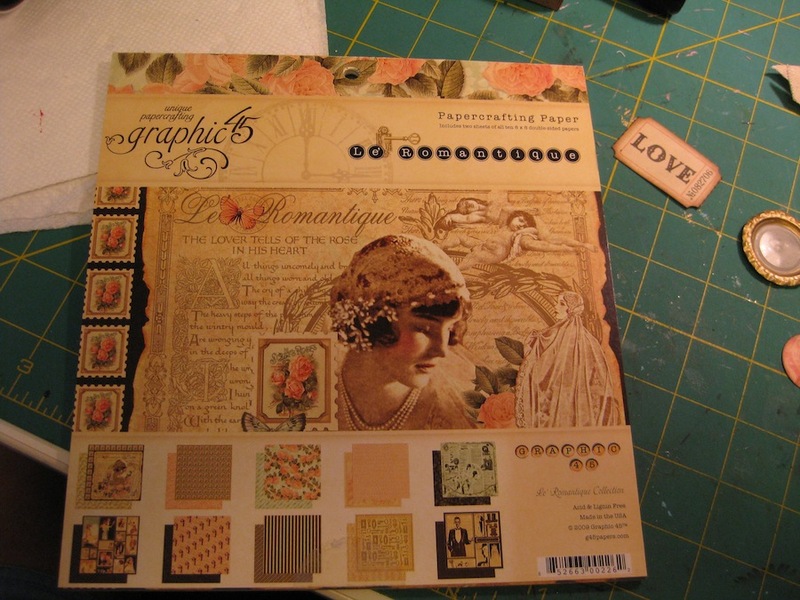 If I have….you’ll get to see it again 😀 I’m sure this is another discontinued die since I purchased it off eBay in 2006. 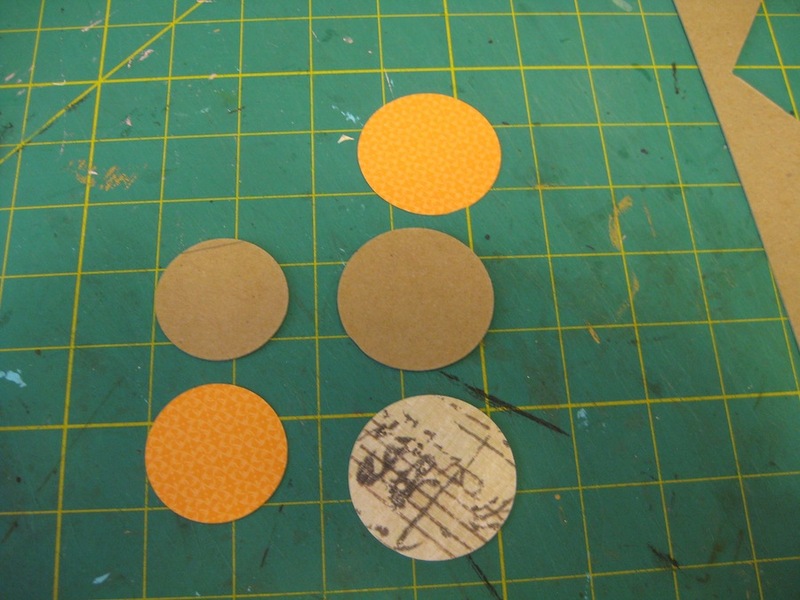 I cut two chipboard circles, the large and the extra large, intended for a different idea that I had. 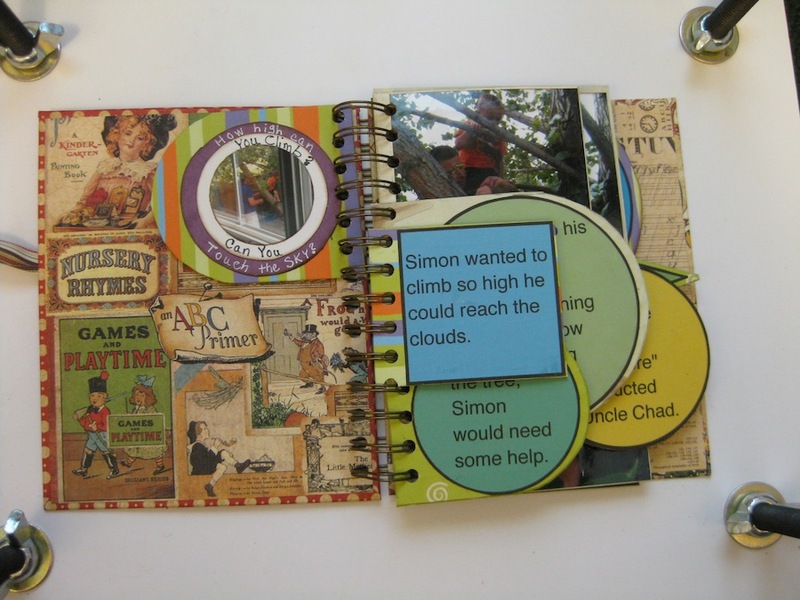 I also cut out paper from my scraps. My original plan didn’t work out. 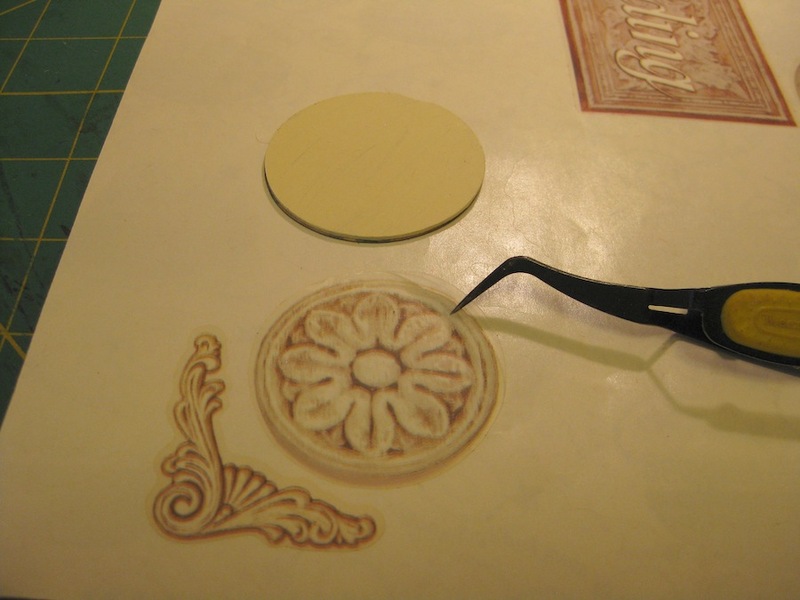 I cut a vellum quote pretty badly. I mangled that poor thing. So…I opted to use the flower sticker instead. Uhm….this is a case of “Less is More”. 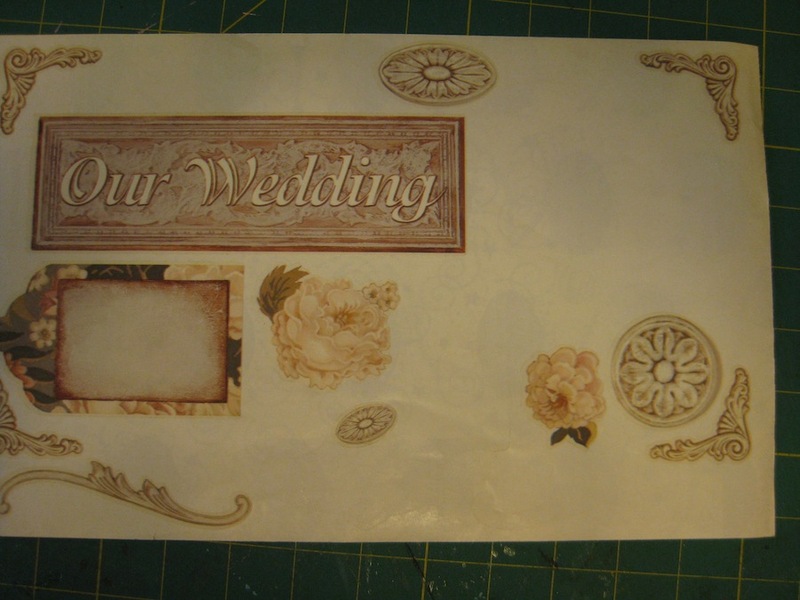 I liked the way the floral sticker looked on the covered chipboard. I was going to leave it just like this. 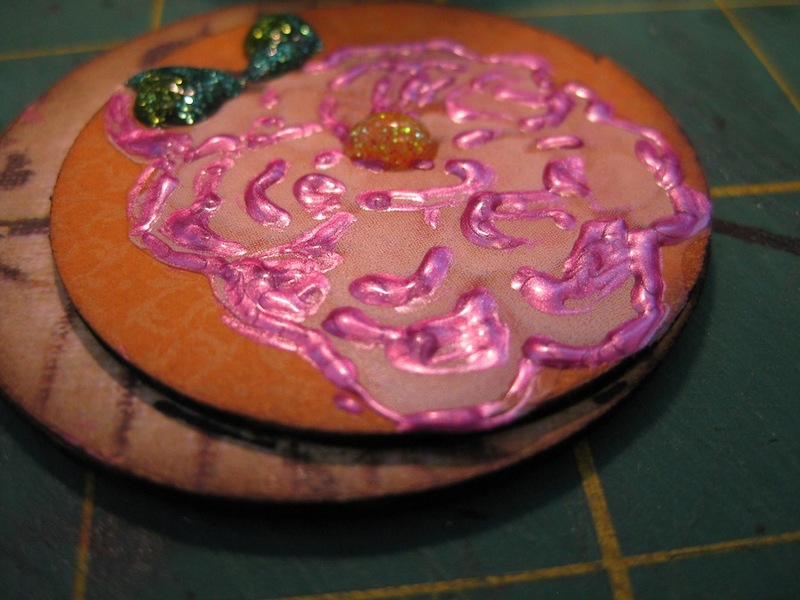 Then I came up with the not so brilliant idea of using Studio G Glitter Glue and Tim Holtz Perfect Pearls. 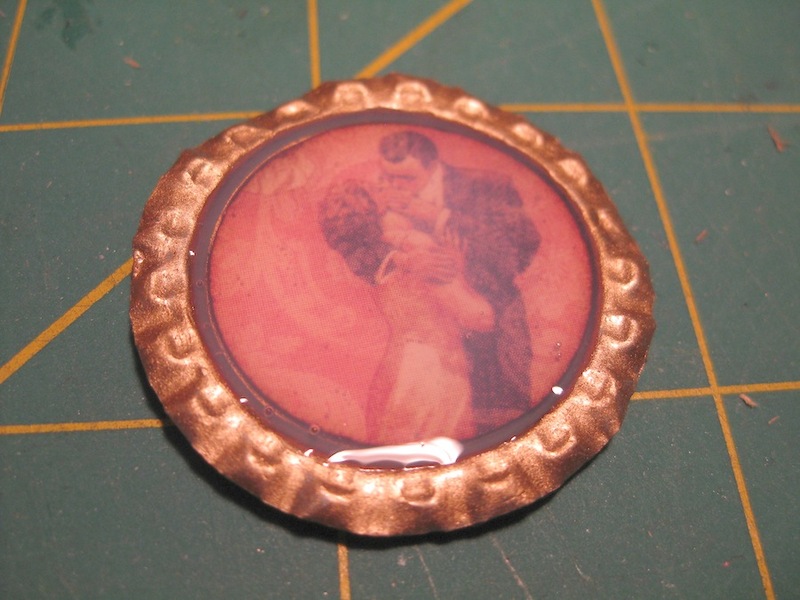 I salved my poor spirits by looking at my bottle cap “epoxy” embellishment. One note I need to pass on to you. Tap out the the dents made from the bottle opener. Back to the sticker sheet. The set that I botched up that beautiful flower. 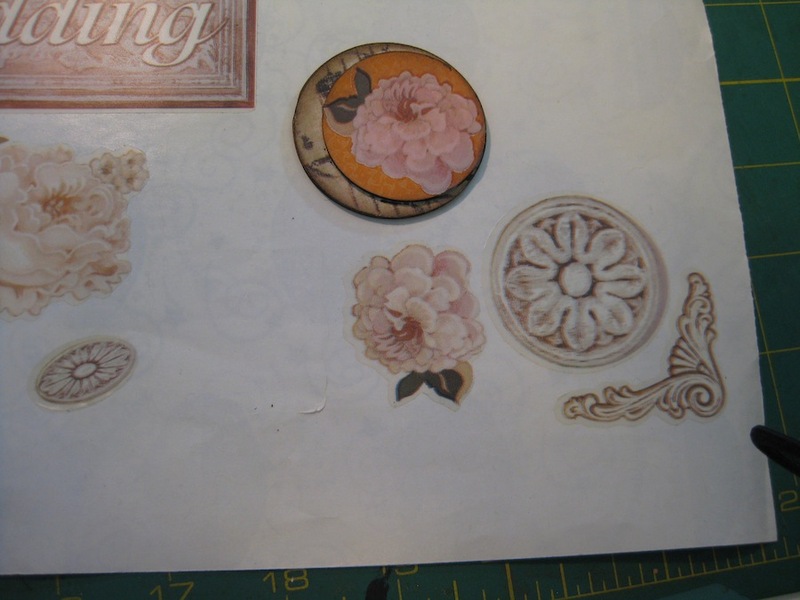 I have two stickers that look like flowers or tin tile piece. NO GLITTER! 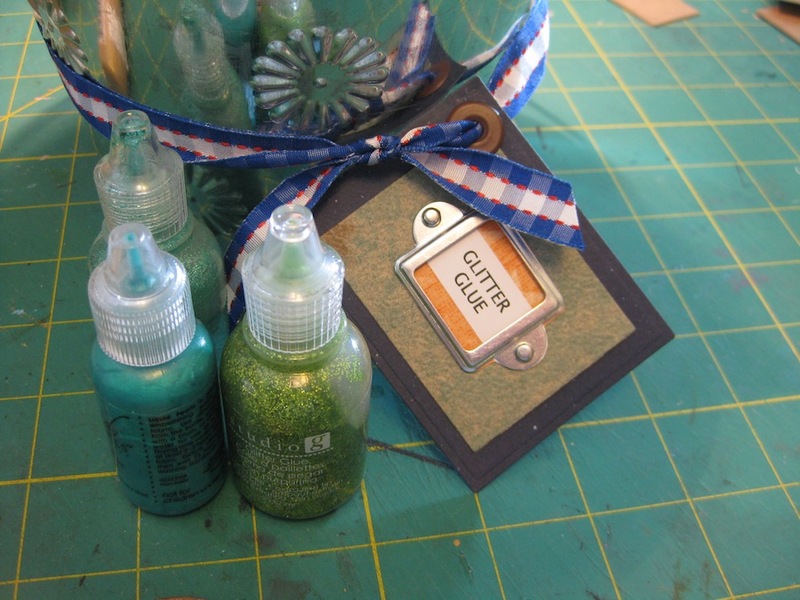 STEP AWAY FROM THE GLITTER! 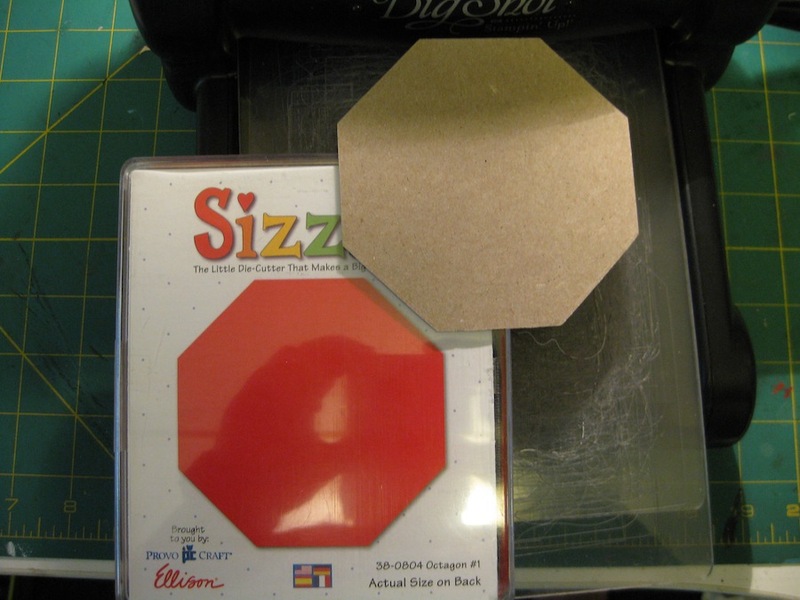 I’m working on an octagonal die from Sizzix. I’ve cut the chipboard piece from it already. 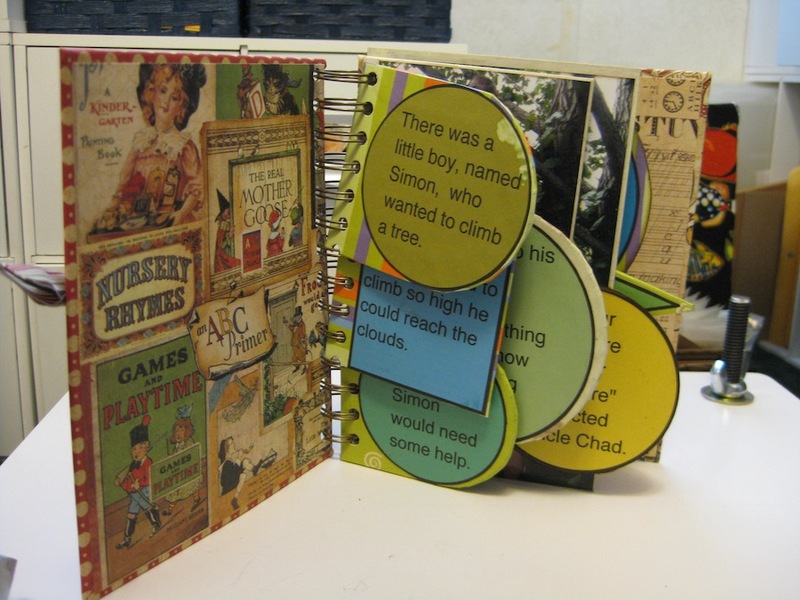 I know that hand punches don’t like chipboard. 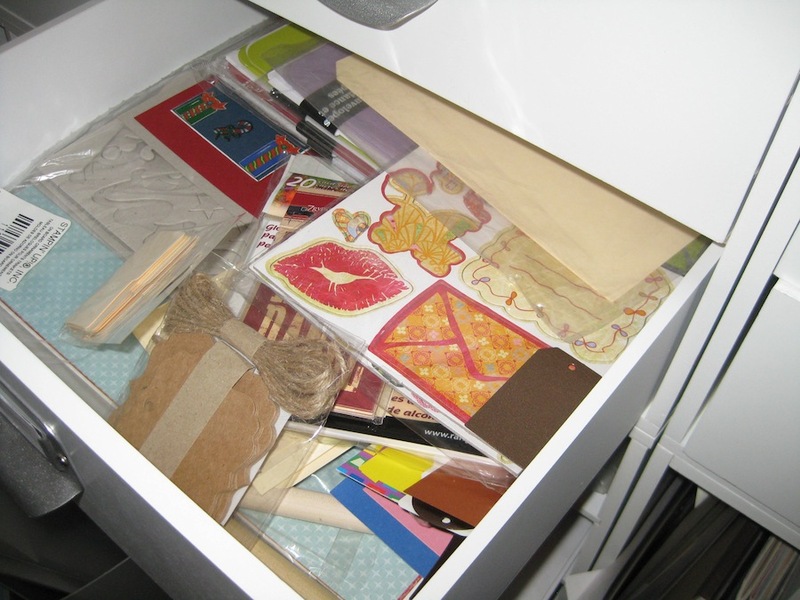 I’m not sure if the Cricut would like chipboard better. I have a machine but I don’t use it so I can’t confirm or deny this fact. Maybe someone out there will know the answer to that. 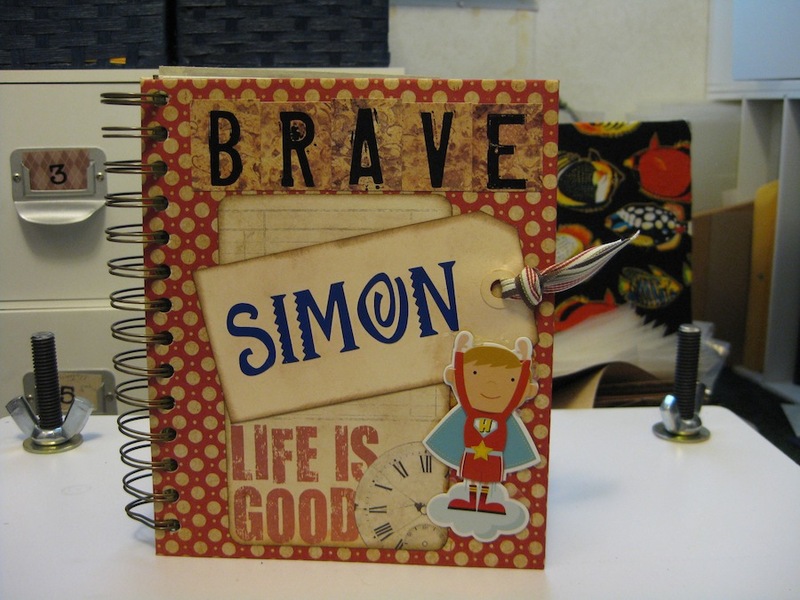 Have I given you some ideas on making your own chipboard embellishments from your sticker stash? If I have…and you have given this a try then leave a link to your creations in a comment below. Yes, indeed. Vellum quotes and beer. 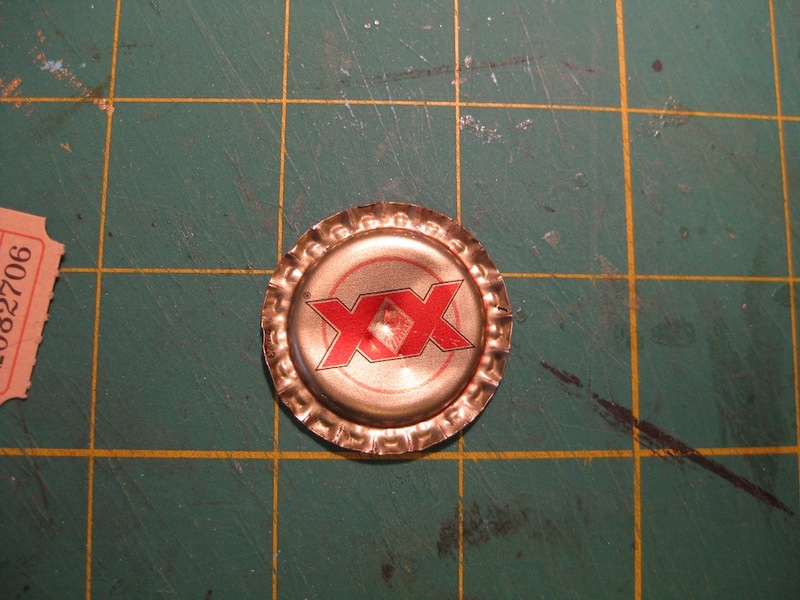 Well….a beer bottle cap. 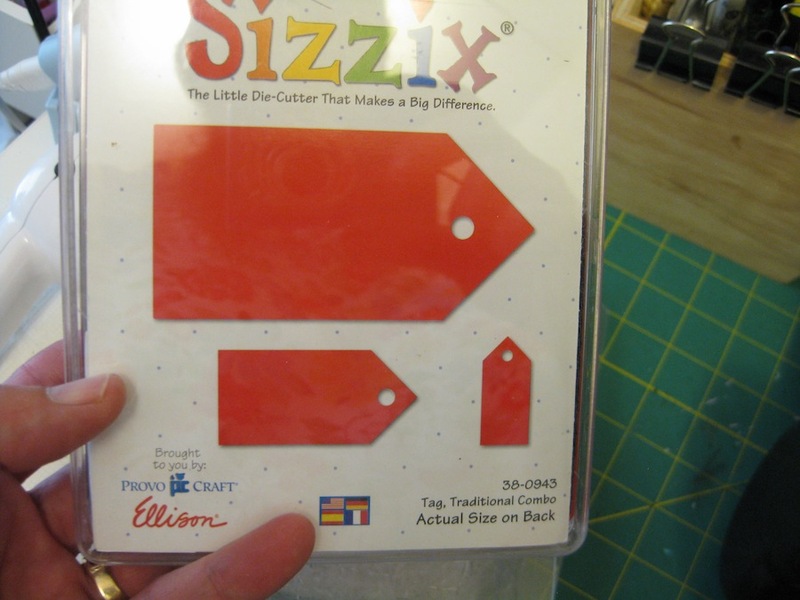 Digging through my stash of Sizzix dies I remembered I had a tag die. Another discontinued one, sorry. This is a “Traditional Tag” die that has three sizes. I chose to use the largest of the three. I located another sticker sheet that has been partially used. Once again, circa 2005. 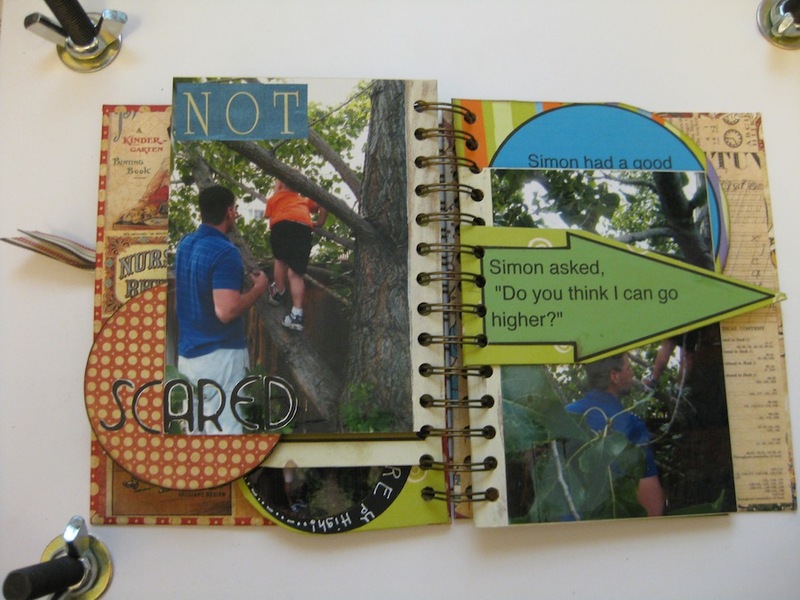 These are by Ever After Scrapbook Company. 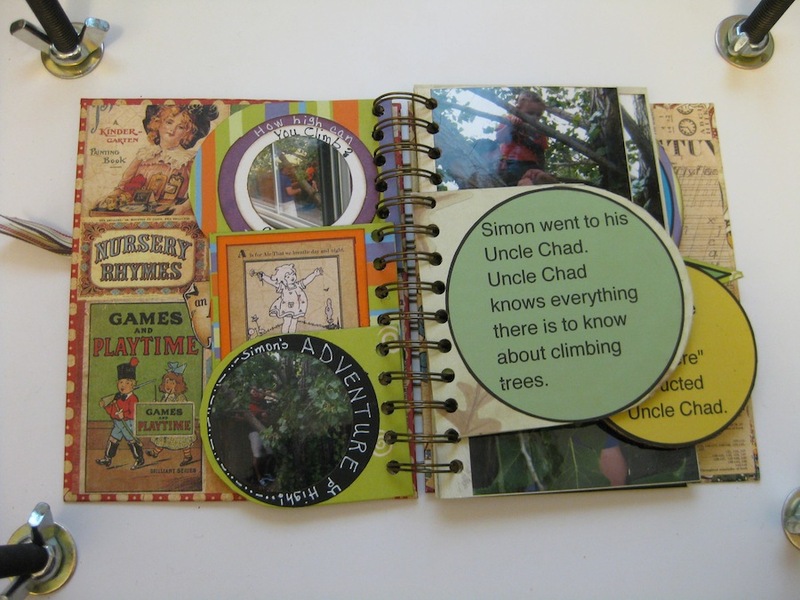 Doing a Google search for the company that created these stickers produces a scrapbook store in Vista, California. There is only a Facebook page for the Vista, CA store. So I can’t tell you anything about these stickers. 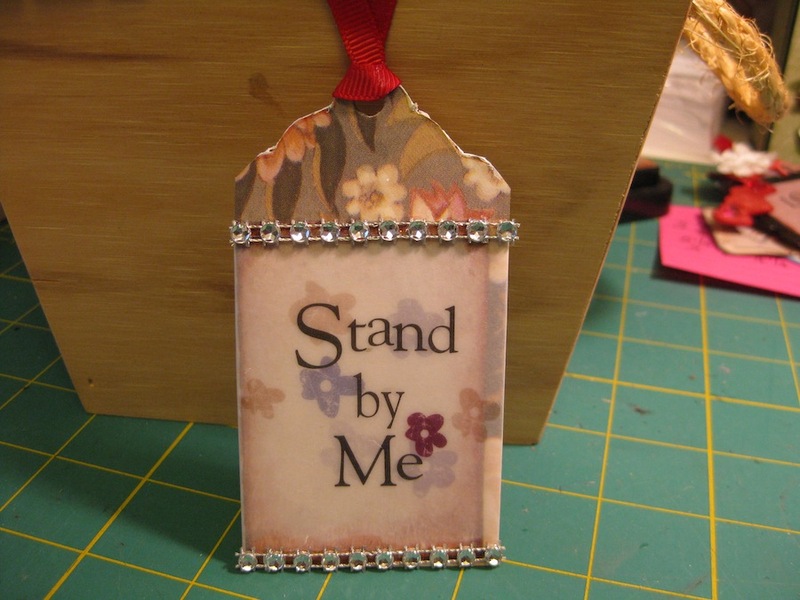 I cut two chipboard tags from the Sizzix die. I painted both of them with white acrylic paint, both front and back. 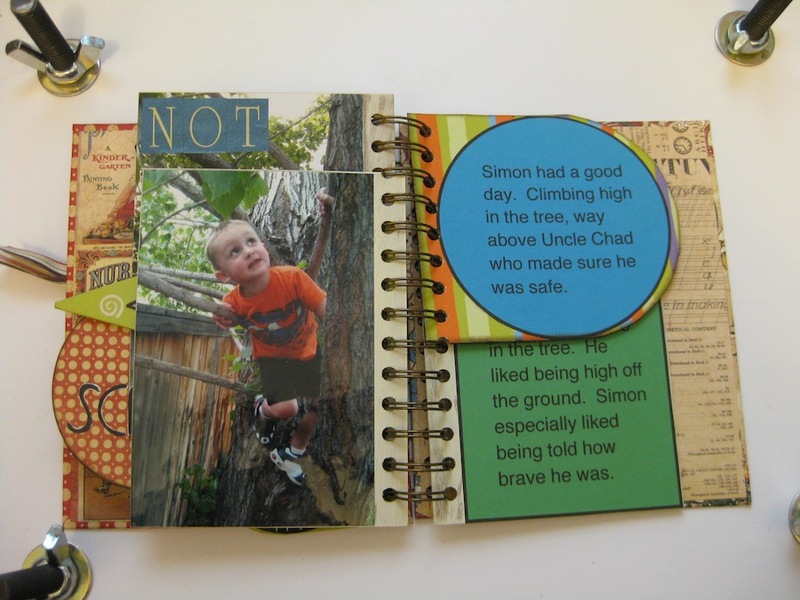 One tag features a tag sticker from the above set and one of the vellum quotes I’ve been trying to use up. 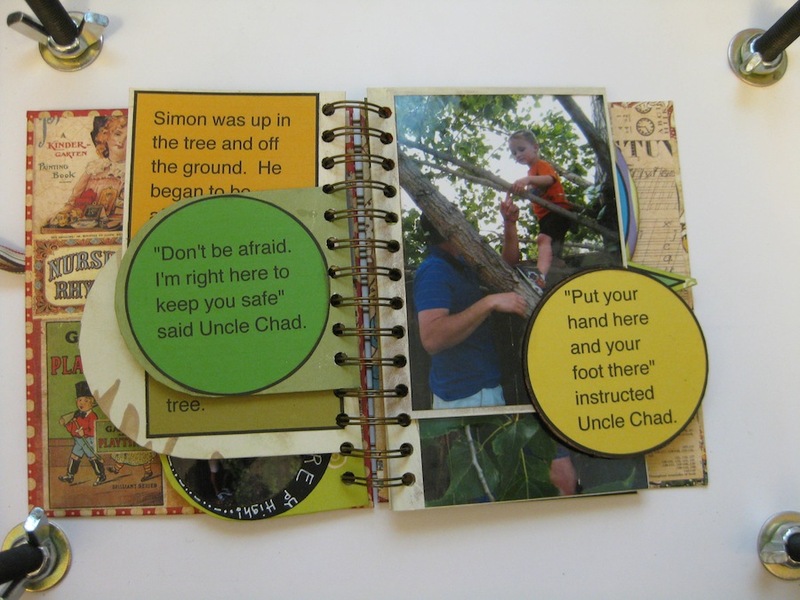 See my post from yesterday to see the vellum quotes. I used a bit of rhinestone ribbon stuff I got from Michaels last year. I thought it was just enough bling to not obscure the message on the tag. “Where does the beer come in?” you may be asking. Well….here is where it comes in. Last year I asked Joe to give me his bottle caps. He looked at me as though I had turned purple with lime green polka dots and sprouted a tail. Then a look came across his face that I interpreted as “(eye roll) Whatever floats your boat”. I tried to explain to him what I was going to do with them. I think he heard “blah blah yadda yadda buzz buzz” because he shook his head and placed the cap in the palm of my hand and promptly walked off. 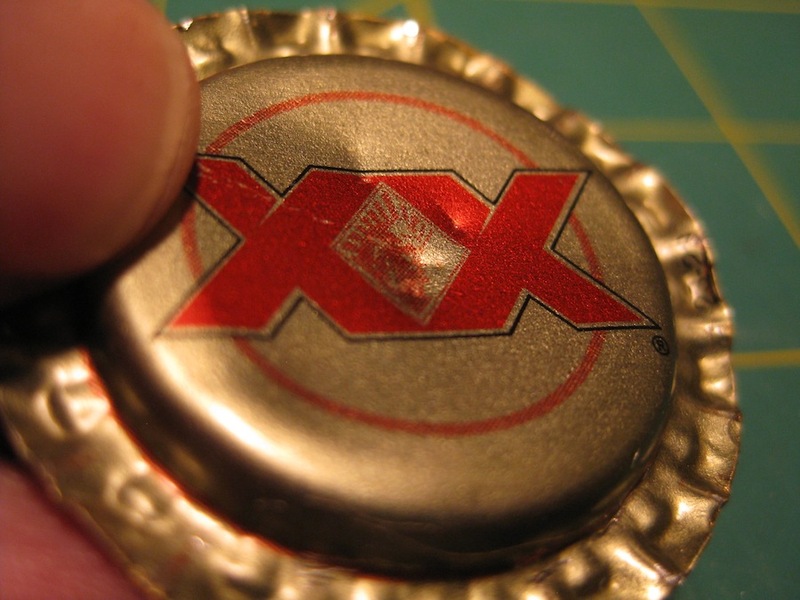 If you have not flattened a bottle cap before…there is a bit of trial and error involved. 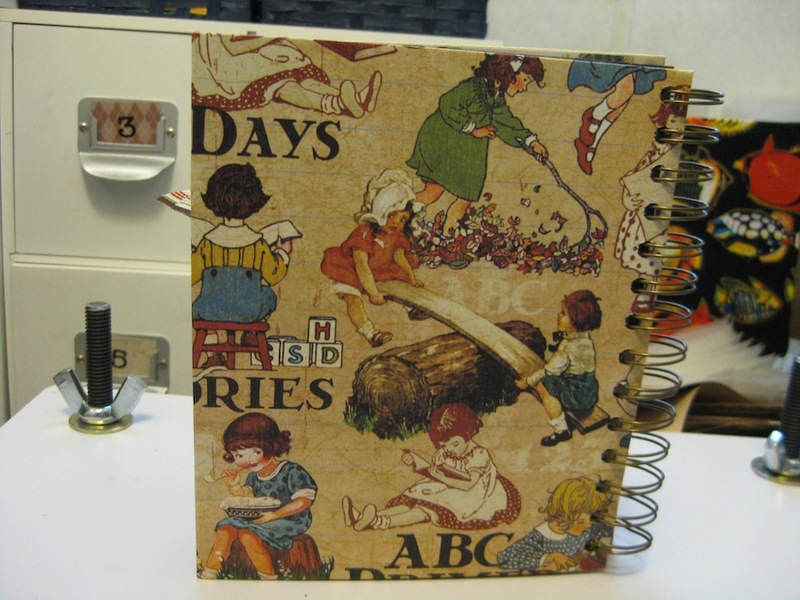 The trick is to use a hammer in small sections of the ribbed edge. Turn the cap upside down with the ribbed part standing up. Flatten a little section at a time. I’ve totally whacked the cap via some vigorous pounding. All I succeeded in doing was rendering the bottle cap totally USELESS! Finesse is not one of my qualities. It is like patience. Hard to come by. Okay. Once you have the bottle cap flattened properly paint the ribbed edge. You can use acrylic paints if you wish to. 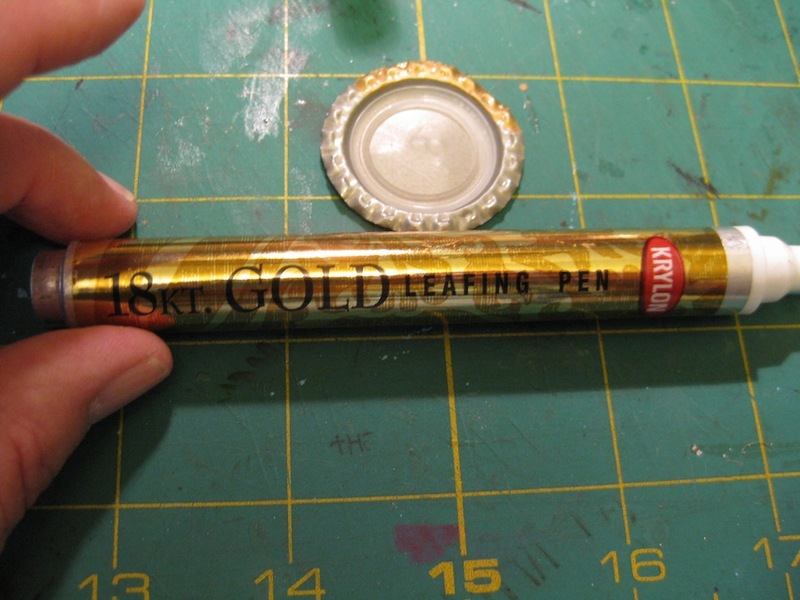 I used a very old Gold Pen that I’ve had since BEFORE 2005! Surprised it still works. 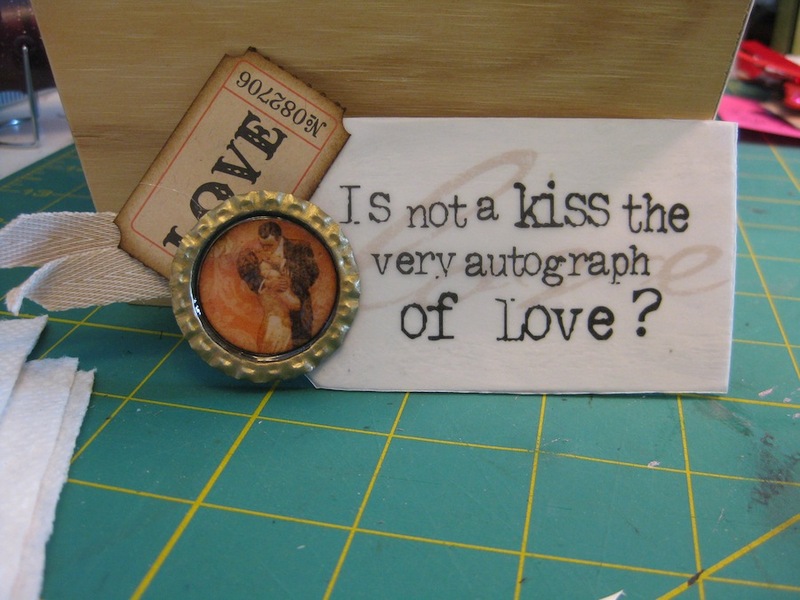 The quote I’m using on this tag features the word “Kiss”. An unsuccessful hunt (okay, not a very in depth hunt) through my stash of stickers looking for the image of puckered up lips. 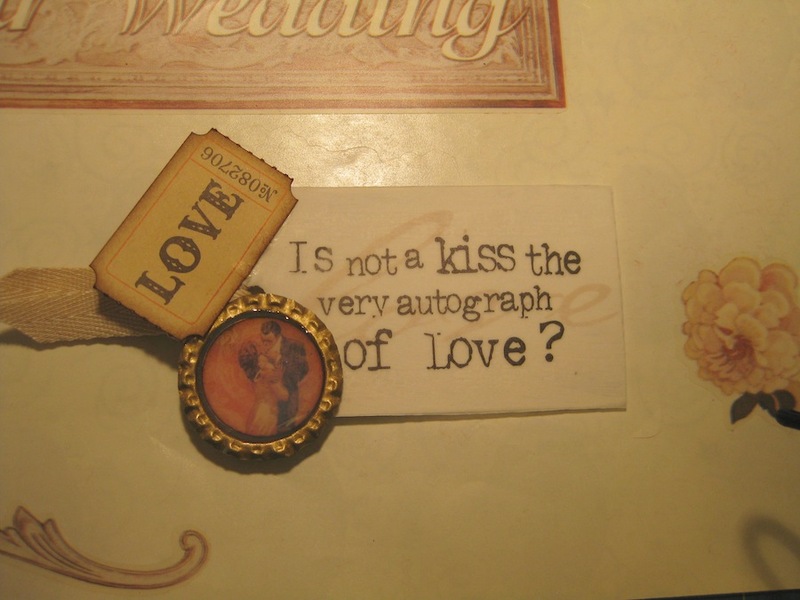 Then I remembered I have an 8 x 8 pad of Graphic 45 papers that might have a couple embraced in a kiss. I found a sheet that is filled with a couple locking lips. The images are fairly small. 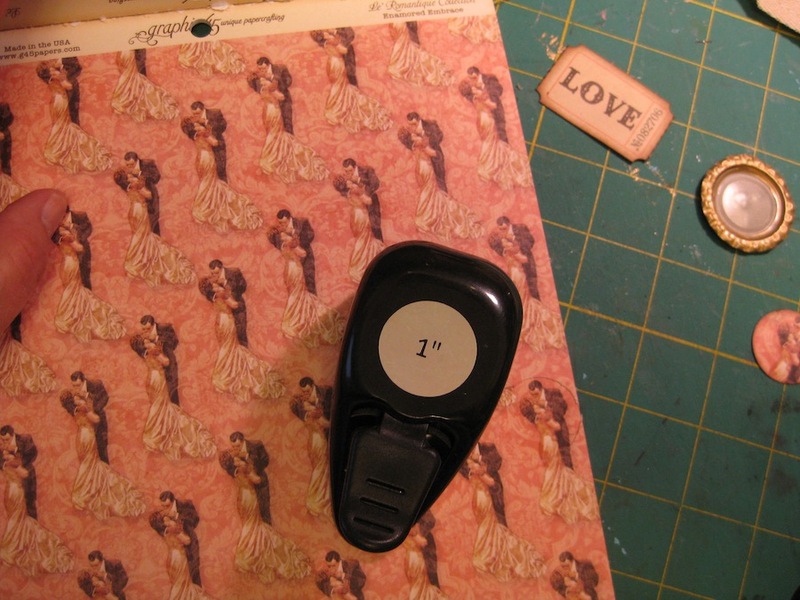 My 1″ hole punch was used to extract one image of the couple. 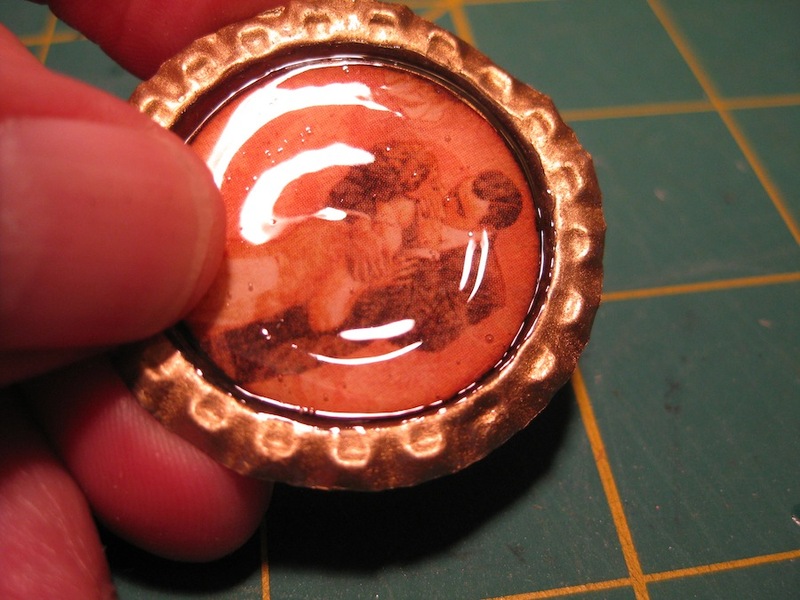 The punched image fits nicely inside the flattened and painted bottle cap. 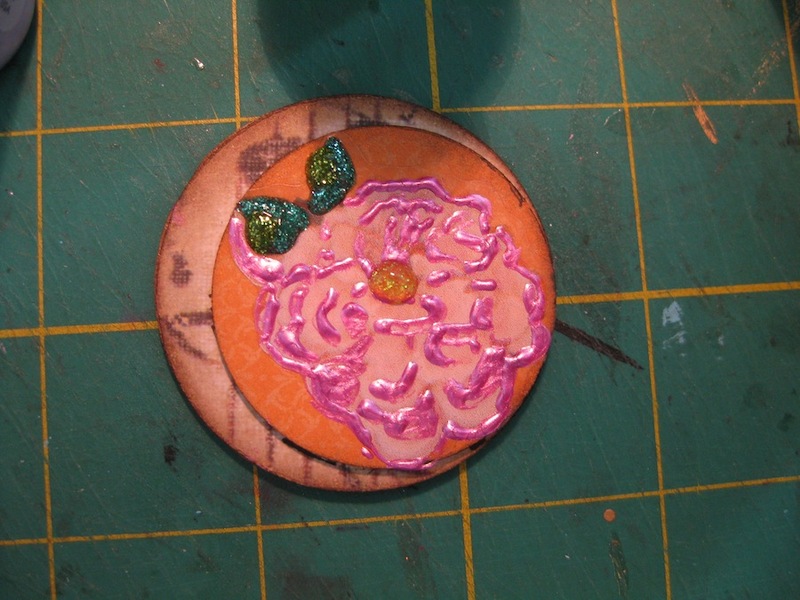 I am going to make this into an “Epoxy” like embellishment. 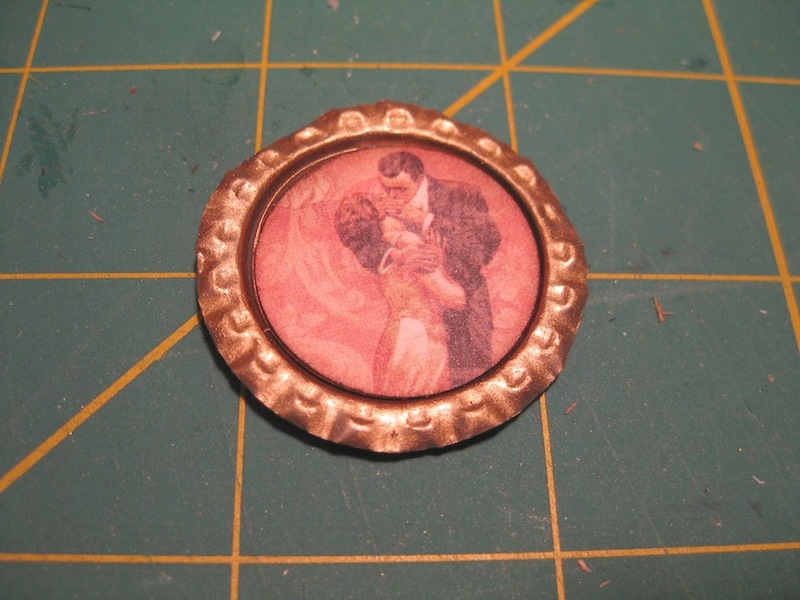 I’ll be using Glossy Accents to, first attach the image to the bottle cap, and then to totally cover the image inside the rim of the cap. This is how I’m planning on creating this tag. 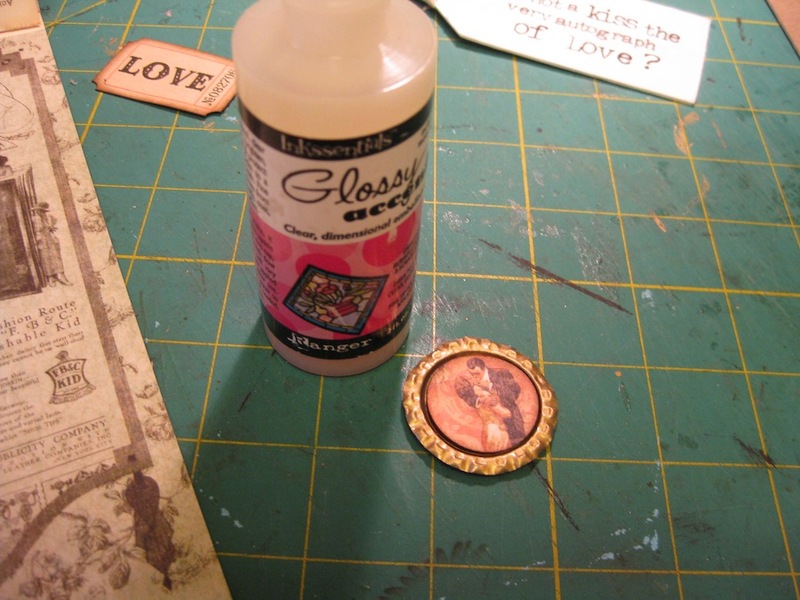 I think I need a flower or something to hide the glue oops coming out from under the Tim Holtz Adage Ticket. Now, the next question I have to ask myself is this. What am I going to do with these tags?! I may be trading a load of stickers for a ton of tags and embellishments. The good part of this is that I’m getting back into being creative and experimenting. BONUS! 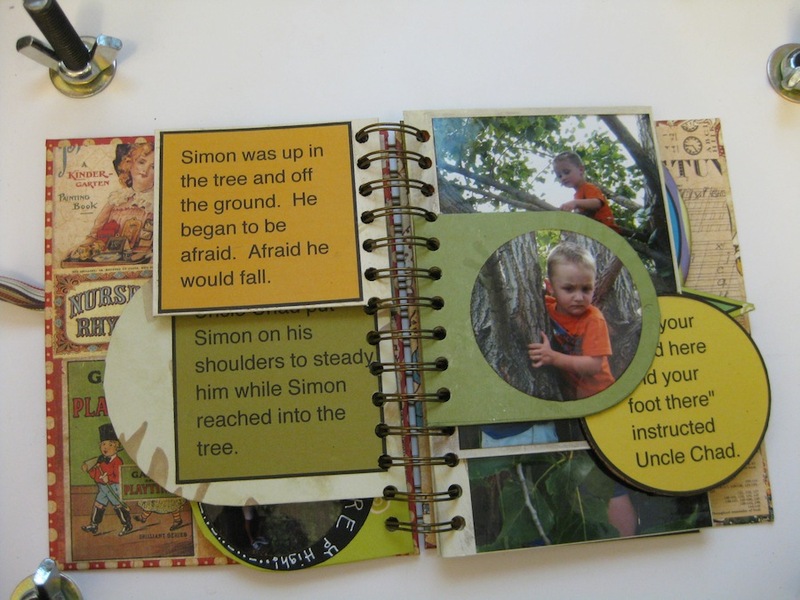 If you are a stamper and make cards….would you consider creating something similar to be attached to a card front when you are in a hurry to put something together? Or save some for the time when your mojo takes a hike for a while?